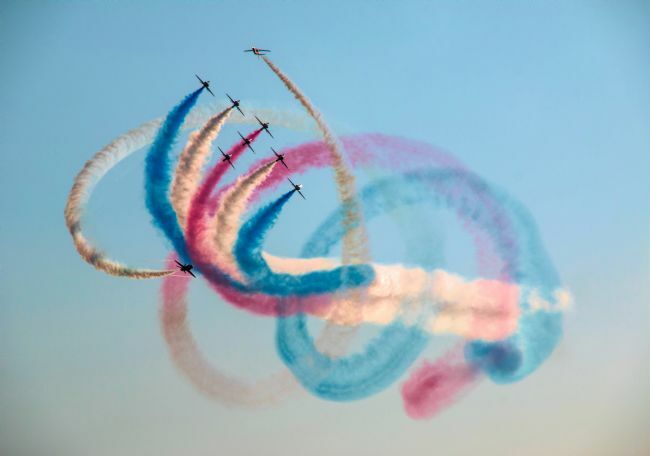 The Red Arrows during a display at Southport Air Show billowing red, white and blue smoke trails in the sky. Autumnal golden light in the Langdales, Lake District. The sun lights up the trees in the foreground and adds a splash of light to the fells behind. 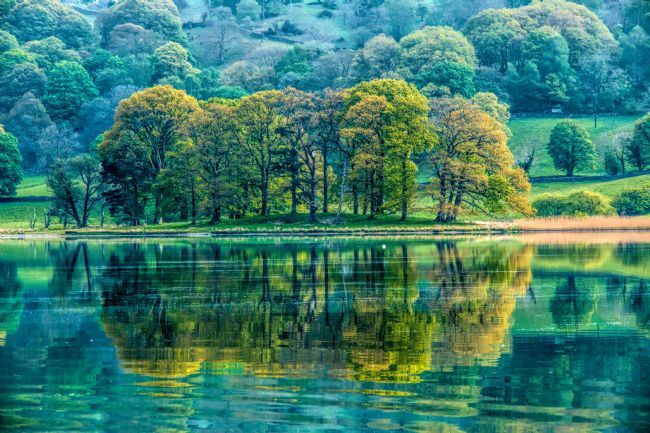 Esthwaite Water reflections during Spring when the leaves are newly formed and the Lake District is transformed into a variety of shades of green. 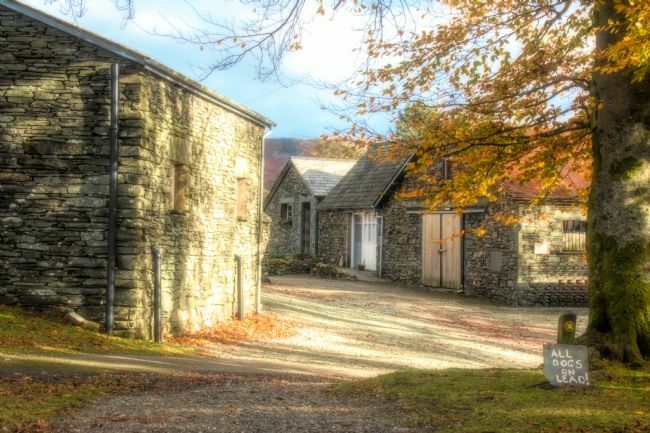 Cumbrian farm buildings in the Lake District during Autumn. The route past these buildings leads to Elterwater in the Langdales. 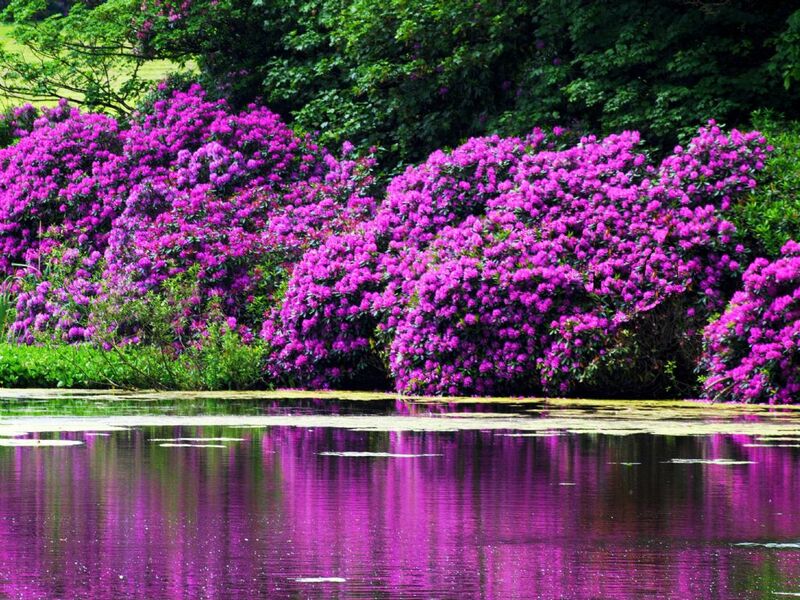 A blaze of purple from a row of spring flowering rhododendrons reflected in a pond on an estate in Parbold,Lancashire,England. 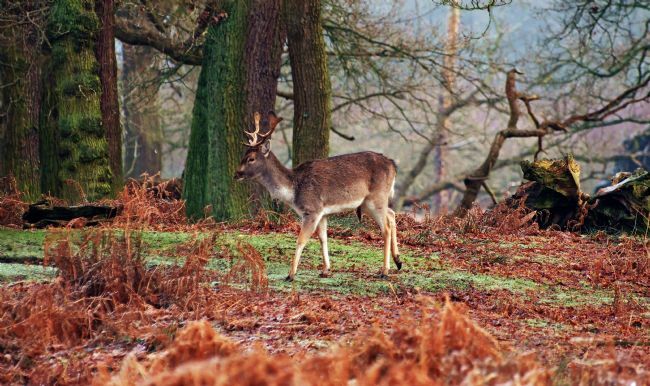 A deer walks among the dead frosted ferns in England. 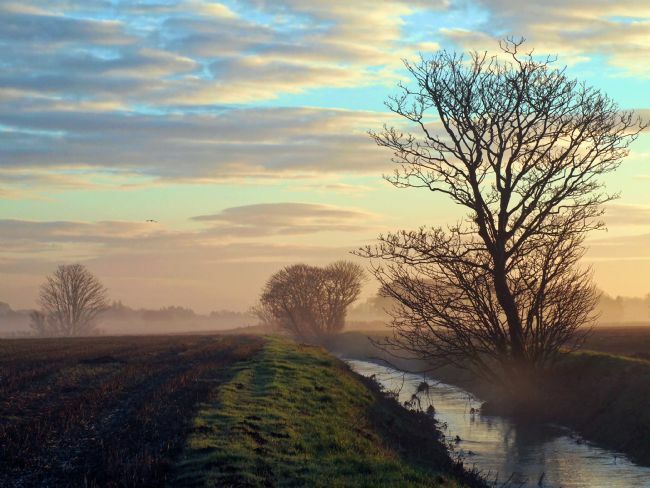 The wintry scene casts different shades of colour left behind from autumn. 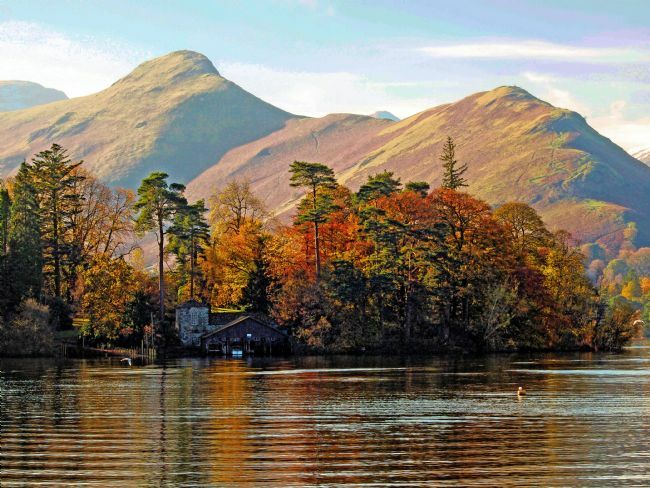 Autumn at Derwent Island on Derwentwater near Keswick in the Lake District. A lake eye view across the lake sees boats moored in isolation and snow capped mountains heralding the start of winter. 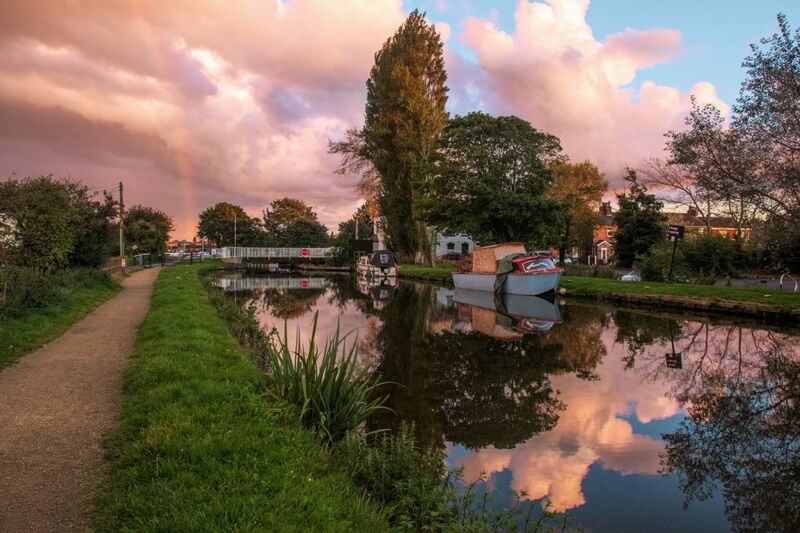 A sunset on the canal in Lancashire with a hint of a rainbow in the distance, The Leeds/Liverpool canal shows refections in the water and moorings are sited near Scarisbrick towards Burscough in West Lancashire. 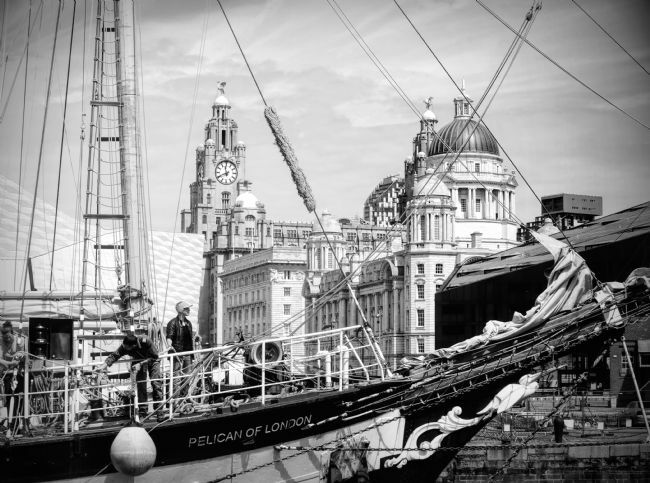 The Pelican of London tall ship enters the narrow gap into Albert Dock in Liverpool, Merseyside for a three day river festival. The Liver building is in the background. 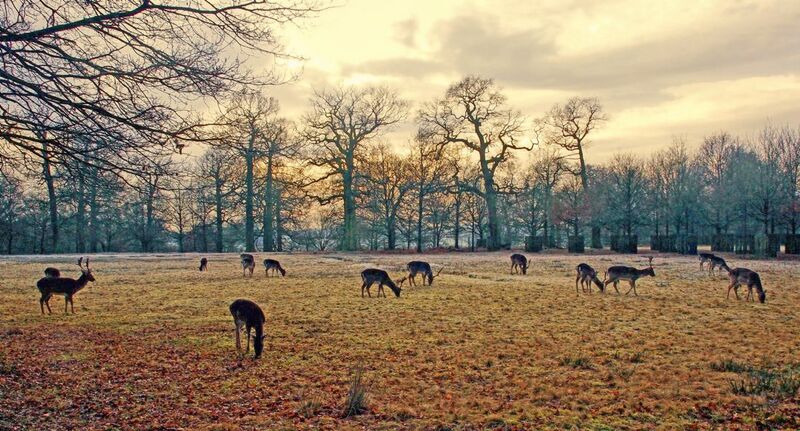 Deer grazing at Dunham Massey deer park in Cheshire on a frosty winter morning. A charcoal painted version of the victorian boulevard on Lord Street ,Southport where June the Florists is sited looking down towards the Atkinson Art Gallery and clock. 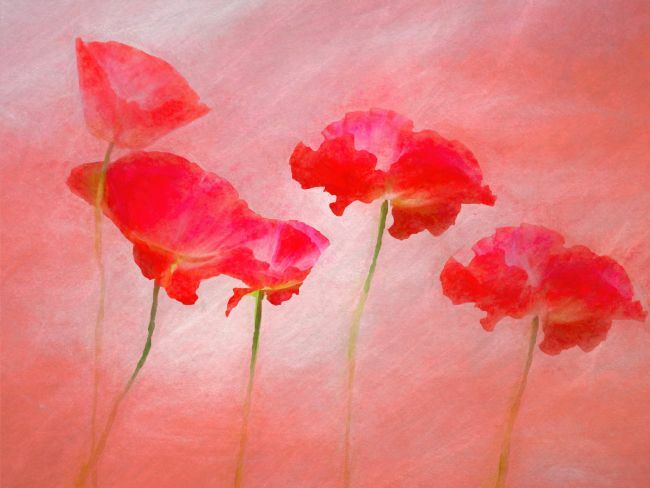 A collection of poppies given a textured and painted appearance. 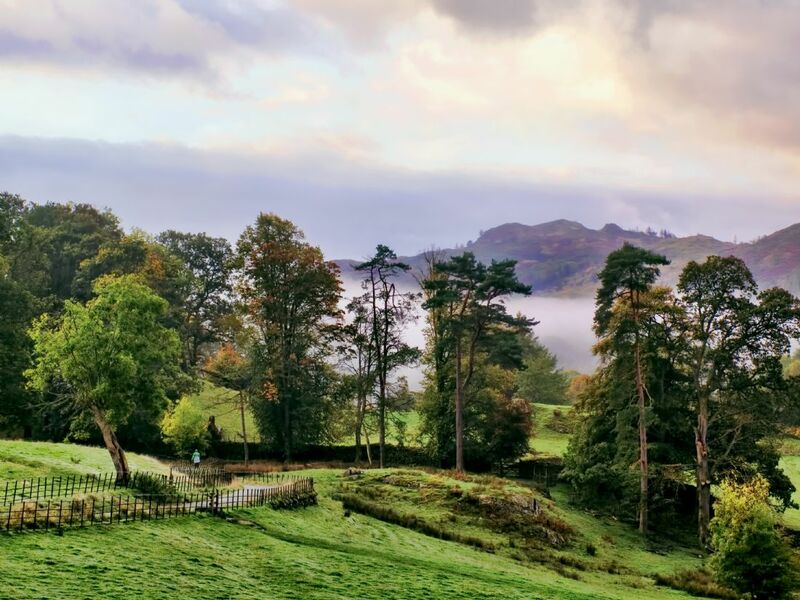 A myriad of autumn colours greets the visitor in the Langdales as they head towards Slater Bridge and the Cathedral Caves.The rolling hills and mountains add shape to the landscape. A thatched cottage in the old part of Churchtown ,Southport is a reminder of bygone years when these used to be for the local fishermen to live in when the tide used to come further inland. Two people seated in a cafe at the end of Southport pier looking out towards the beach on a sunny day. 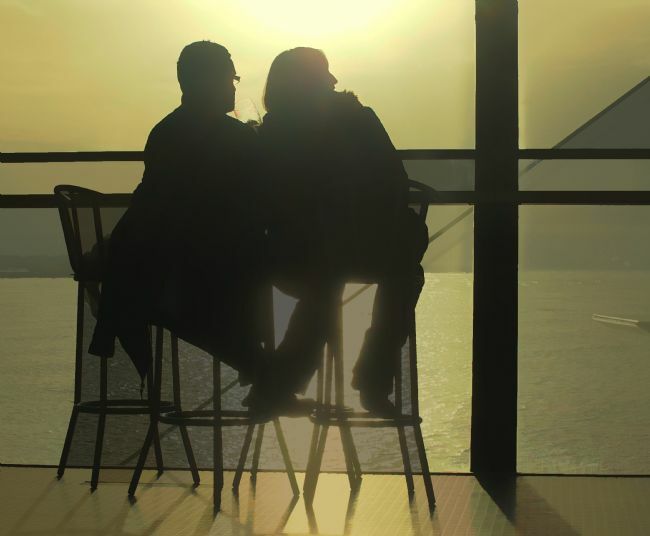 Their bodies, table and chairs are sihouetted against the window. 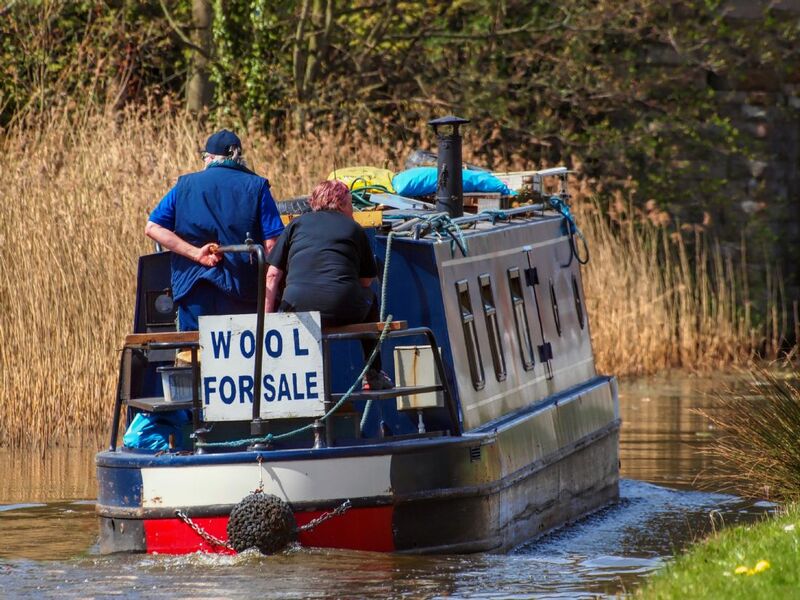 The familiar sight of the Wool Boat making it's way down the Leeds/Liverpool canal inBurscough, Lancashire. It's a sign of the lifestyle of narrowboaters on the canal selling their wares. 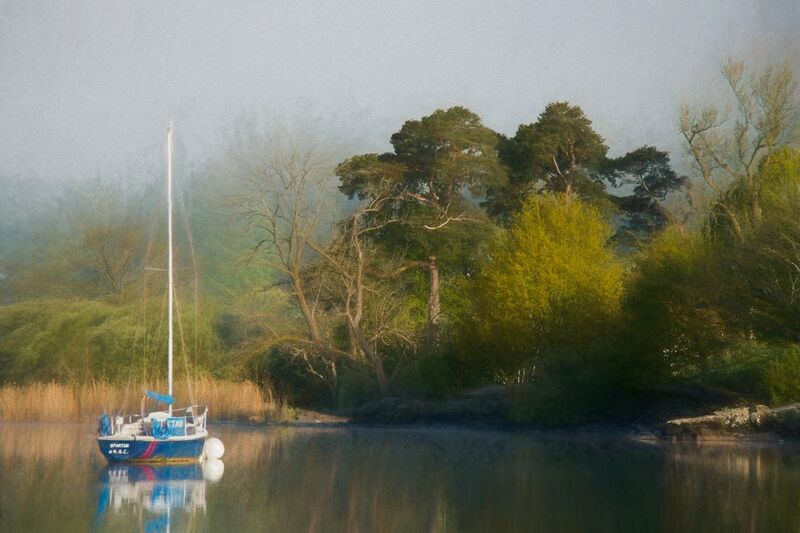 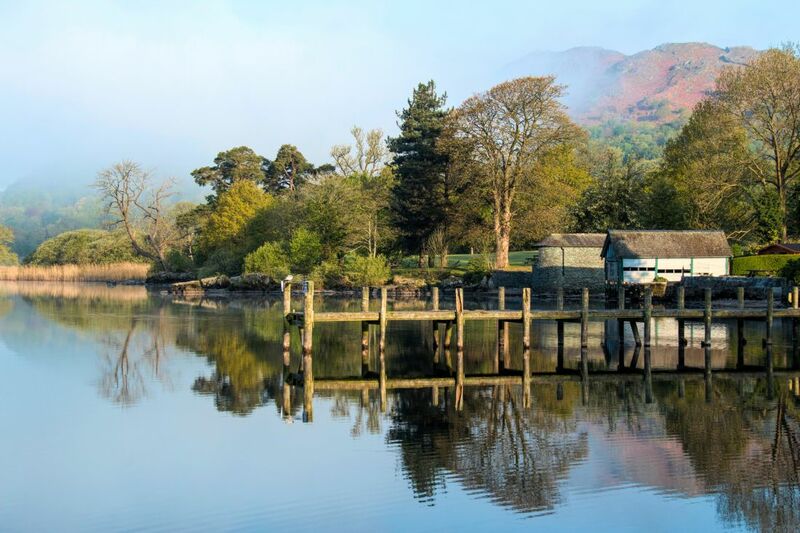 Ambleside boat house and jetty on a misty morning at Waterhead with refections on the calm water of Windermere. 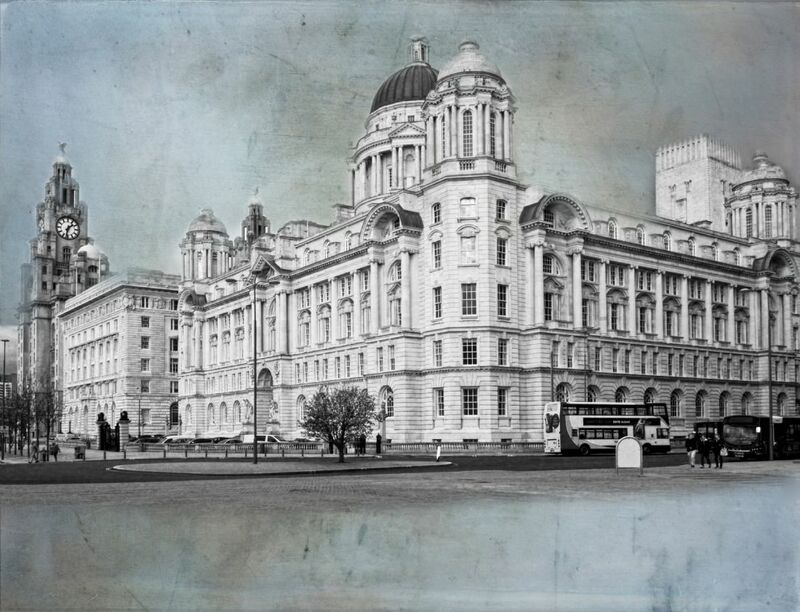 Liverpool's waterfront showing the Three Graces which consists of the Liver building,Cunard building and the Port of Liverpool building. 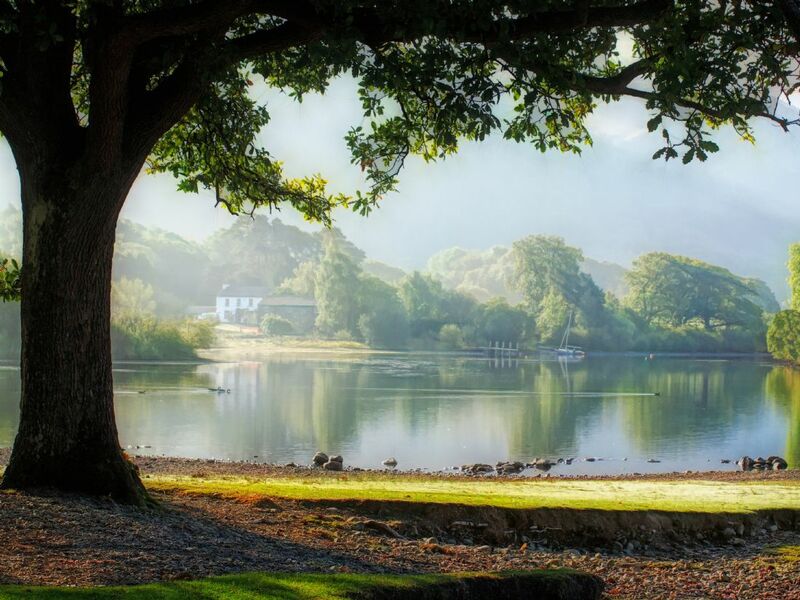 A view of the framed shoreline of Derwentwater near Keswick ,Lake District on a misty day usig a tree as the frame. 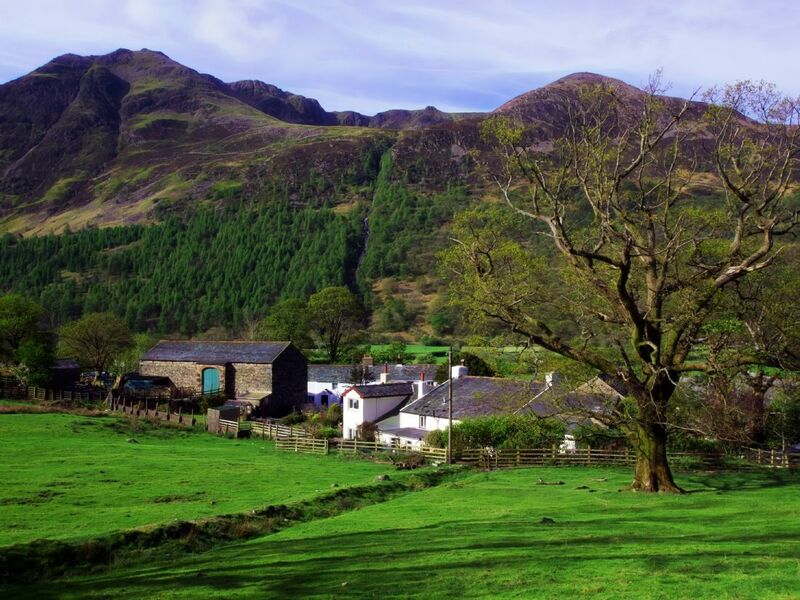 The village of Buttermere nestled among farmland and the surrounding fells. Ahead is a waterfall streaming down from the fells. The tall ship Stavros illuminated at night while docked at Albert Dock in Liverpool, Merseyside.The moon briefly appearing from behind a cloud and the reflections from the surrounding buildings on the calm water adds to the ambience. 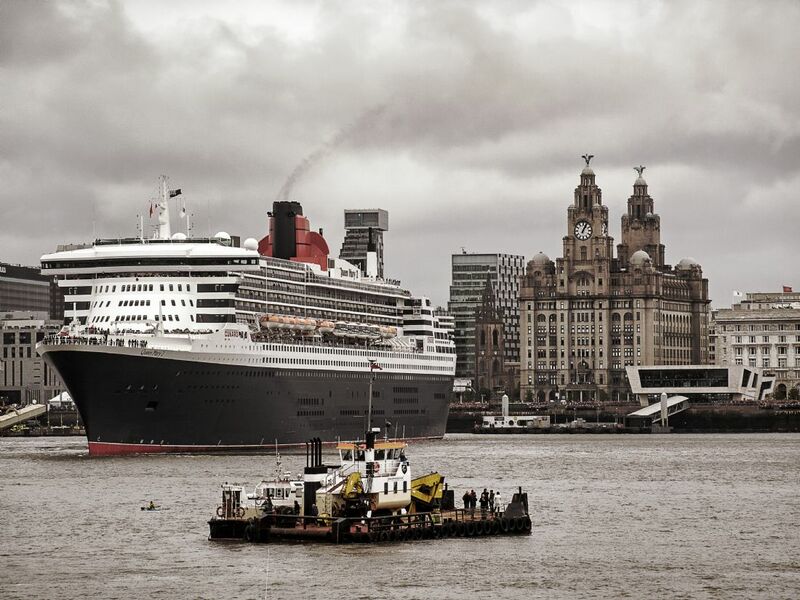 The Cunard ship Queen Mary 2 sails into Liverpool down the River Mersey for the Cunard celebrations.The famous landmark of the Liver building is in the background with a flotilla of boats guiding the huge cruiser..
A black and white photo showing all three of the famous buildings on Liverpool's waterfront consisting of The Liver building,The Cunard building and The Port of Liverpool building.Image finished with a texture. 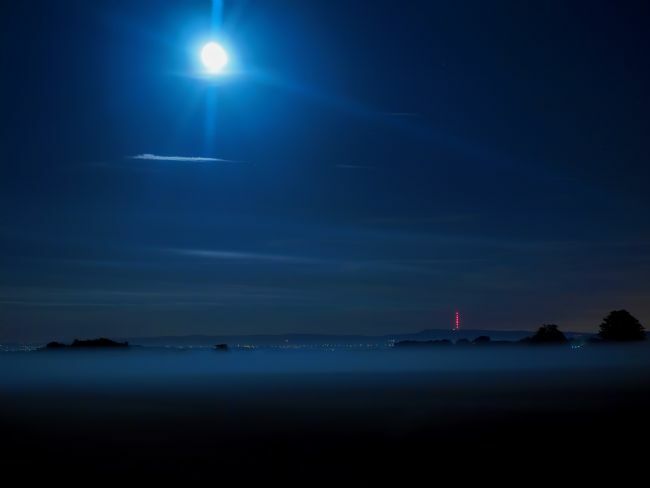 Night fog under moonlight in Scarisbrick,Lancashire looking towards Winter Hill which has the red lights of the television transmitter glowing in the distance. The image has a magical feel about it with the low lying mist. 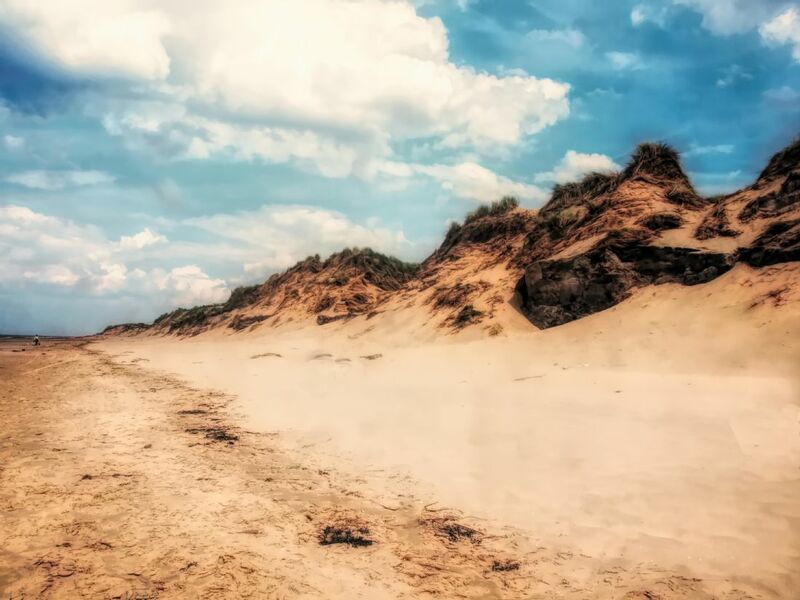 Formby sand dunes on Merseyside is a coastal defence where several tonnes of tobacco waste has been dumped among the dunes to help shore it up.Image has a slight vintage effect. 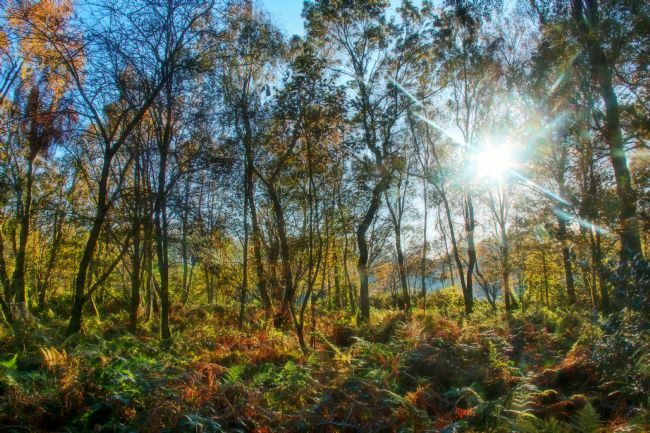 A starburst among the trees and ferns at Meresands nature reserve in Rufford , Lancashire lights up the autumn colours of the ferns. A view over Windermere from Loughrigg Fell in the Lake District. 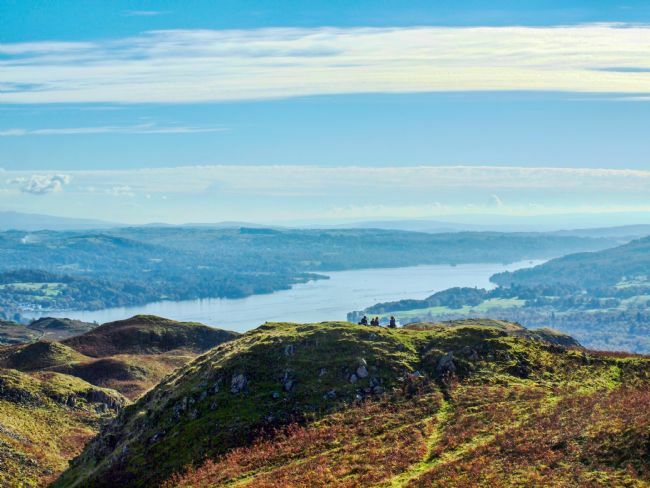 Three walkers are seated on a rocky outcrop to admire their surroundings. 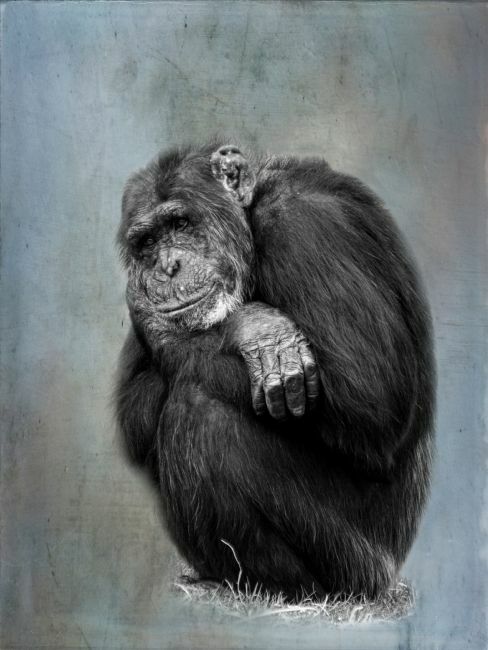 A chimpanzee with the Monday feeling expression on his face. 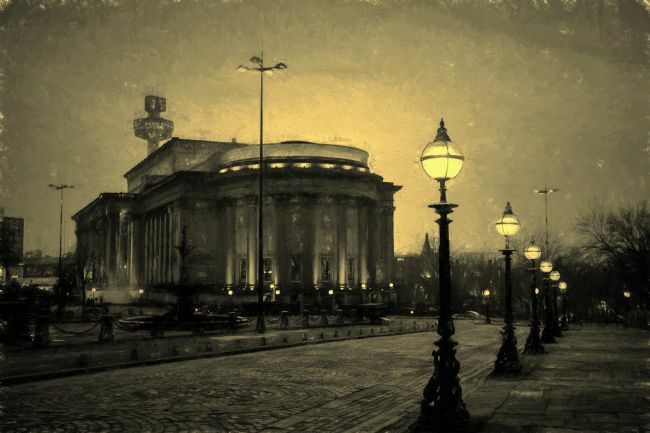 Image given a textured effect. 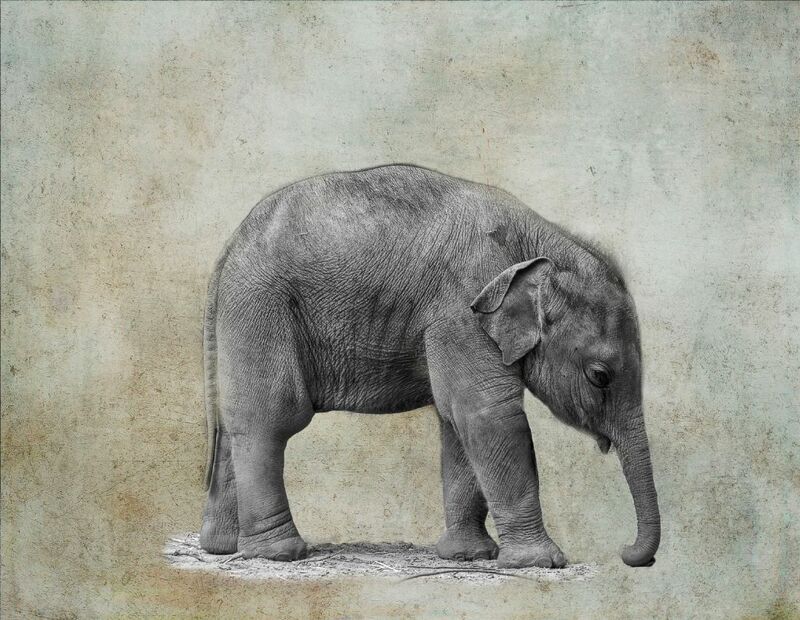 A baby elephant image given the textured art treatment. 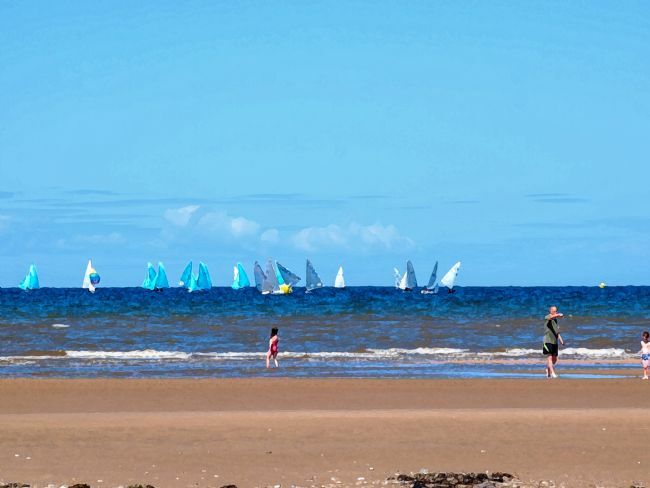 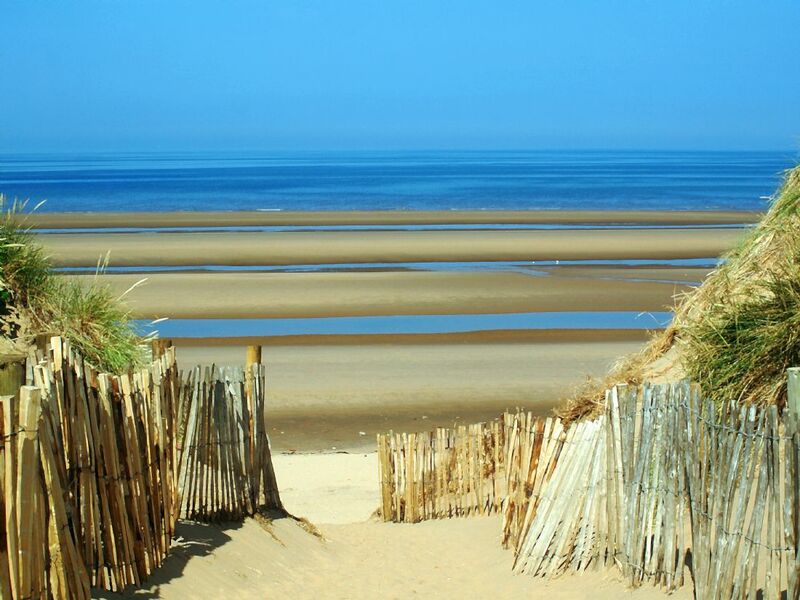 Ainsdale beach near Southport England,one busy weekend with yachts sailing and people paddling in the sea. A typical warm summers day beside the seaside. 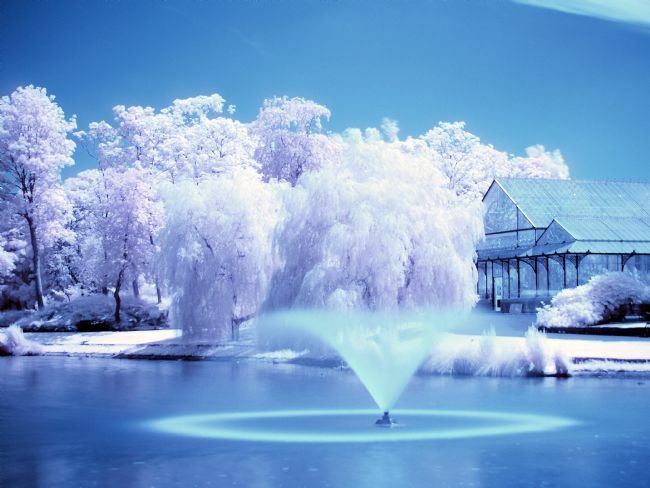 An infrared image of Hesketh Park in Southport, Merseyside with the trees looking as if they are snow laden and the fountain and lake is looking icy. A walk at Loughrigg by Loughrigg Tarn on a misty morning in the Lake District. The iron railings guide a walker on a path through the Langdales. A young giraffe image given a scratched bronzed texture and a painted effect. 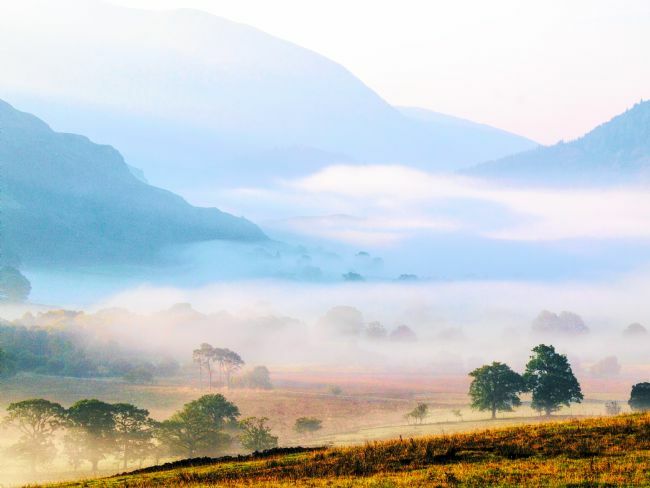 Mist in the valley early one morning at Castlerigg near Keswick in the Lake District. It slowly burns off as the sun rises casting a golden glow onto the grassy fell. Looking to Grasmere in the Lake District across the mere during autumn when the leaves are changing colour and the calmness of the day shows the reflections in the water of the surrounding fells and trees. 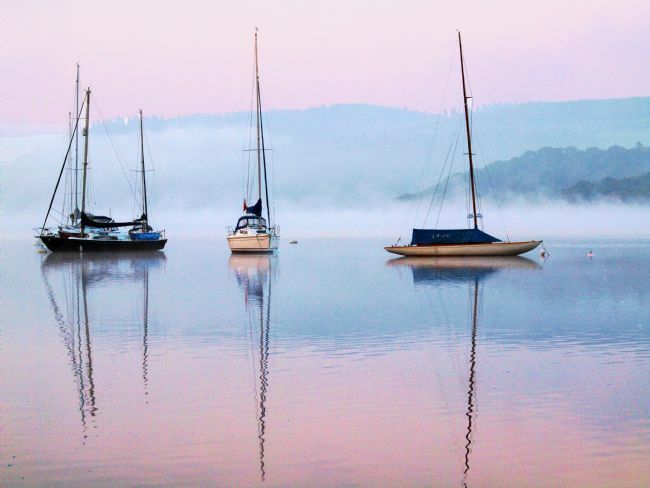 Ambleside boats and their reflections one misty autumn morning in the Lake District,Cumbria. Looking like bows and arrows looming from the mist. The road to Buttermere in the Lake District is narrow and winding with drystone walls en route. Farmhouses are dotted along the wayand makes it a scenic route. 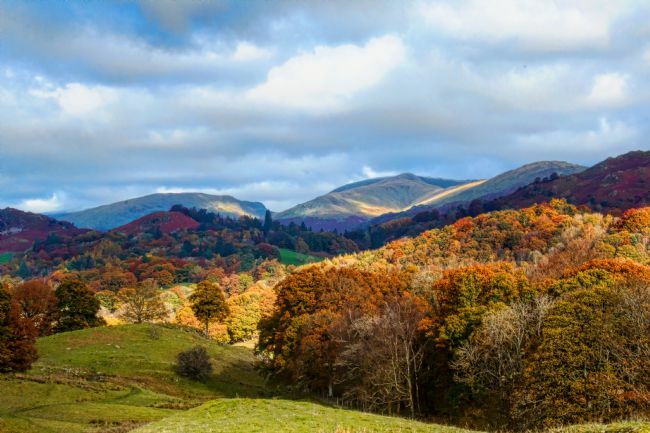 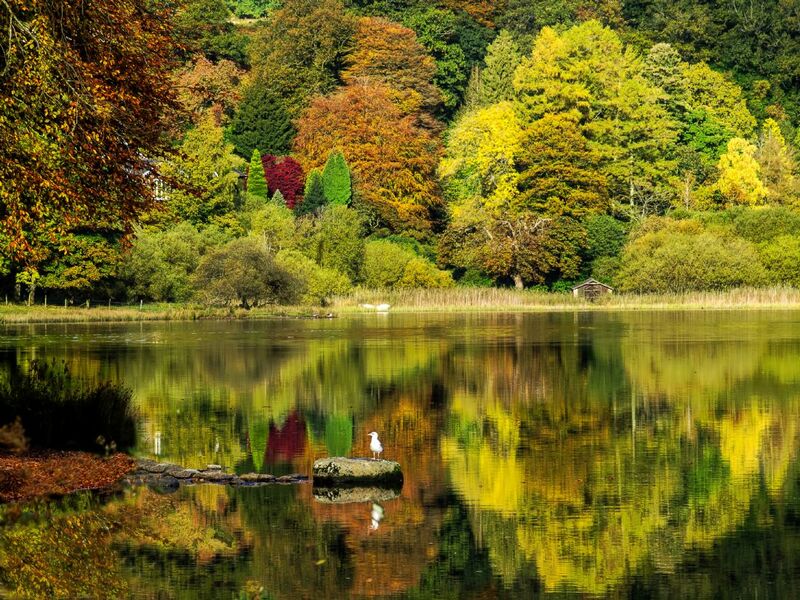 Autumn at Grasmere in the Lake District with a bank of trees all showing off their colours of gold, purples, greens and orange. 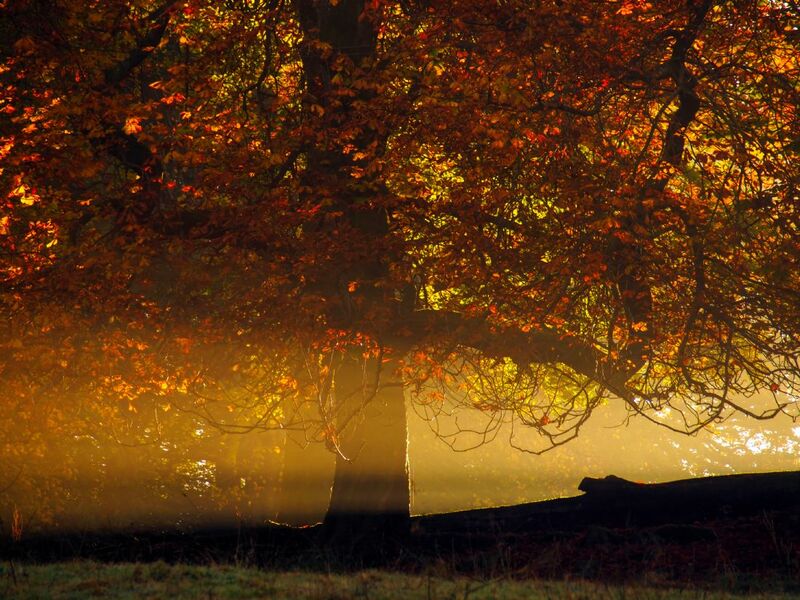 The sun filters through mist early one autumn morning on Brantfell near Windermere in the Lake District lighting up the golden colours of a tree. 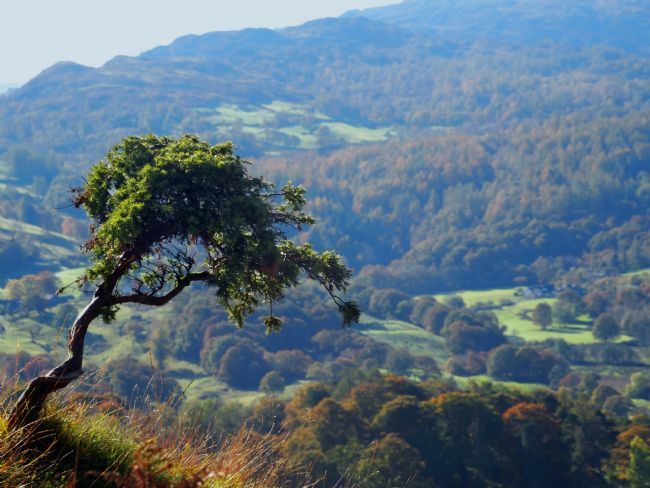 A lone tree at Loughrigg near Grasmere in the Lake District juts out of the rocky outcrop with views of the surrounding fells in the background. 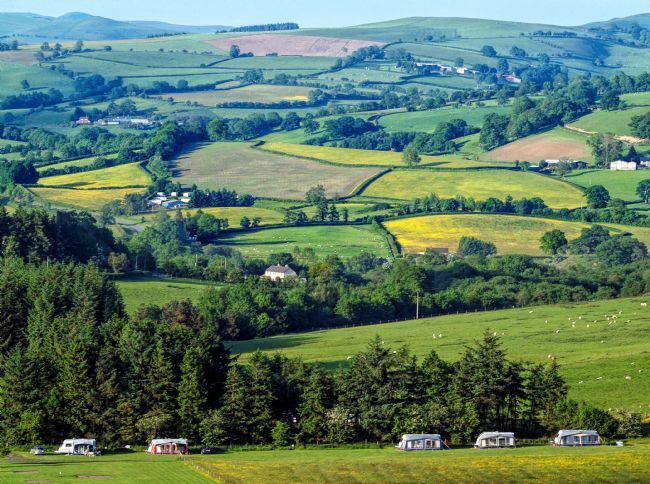 Patchwork fields behind Fforestfields camp site in rural Wales near Builth Wells,Powys. The fields are enclosed with hedges and fencing for sheep and crops.In the foreground are a few caravans and awnings. 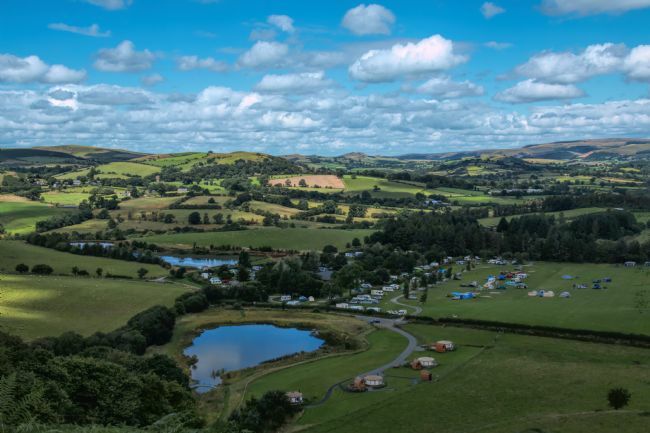 A welsh vista across the hills of Wales towards Builth Wells with Fforest Fields campsite nestled on a hill farm and the lakes giving a splash of blue among the green. 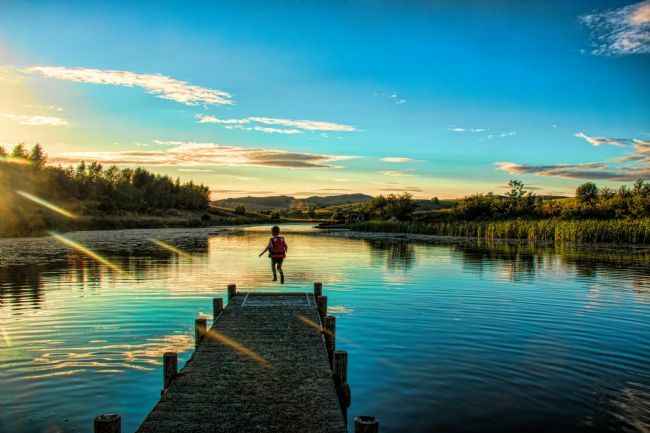 A young boy jumps off the end of a jetty into the lake at sundown at Fforest Fields campsite in Wales.A beautiful calm evening with sun rays hitting the lake as the sun sets. 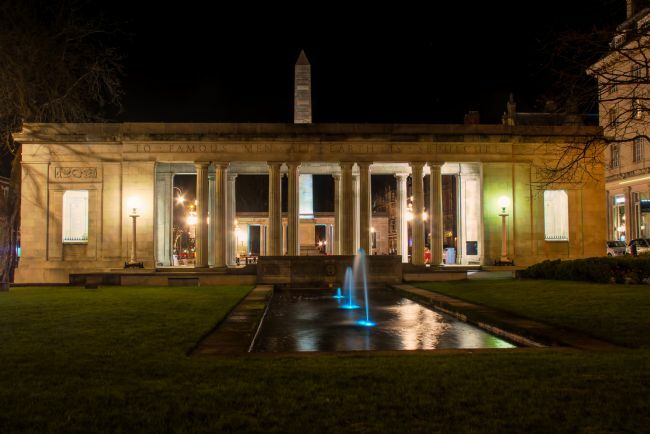 The war memorial on Lord Street, Southport Mereyside illuminated at night with the fountain lit up in blue.There are two memorials with the names of the war ead etched on stone in the open pillared monument. 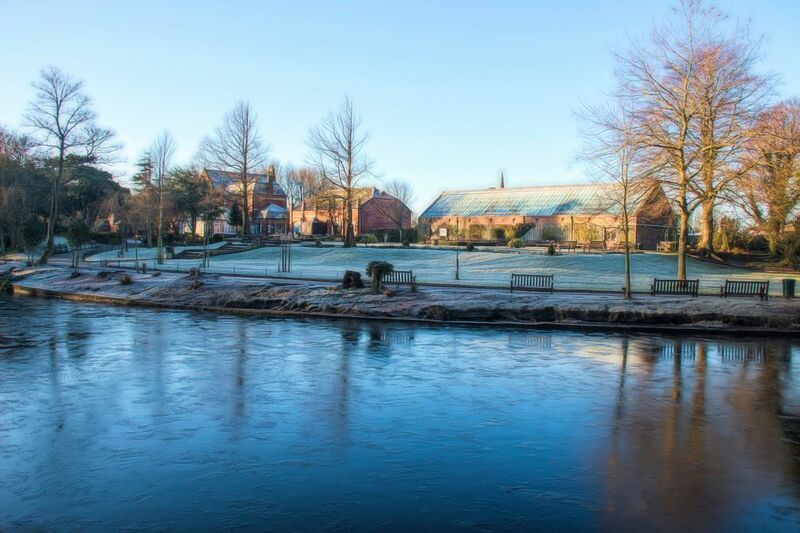 The Botanic Gardens at Southport, Merseyside during an icy spell in winter.The trees are bare and ice is seen floating on top of the lake. 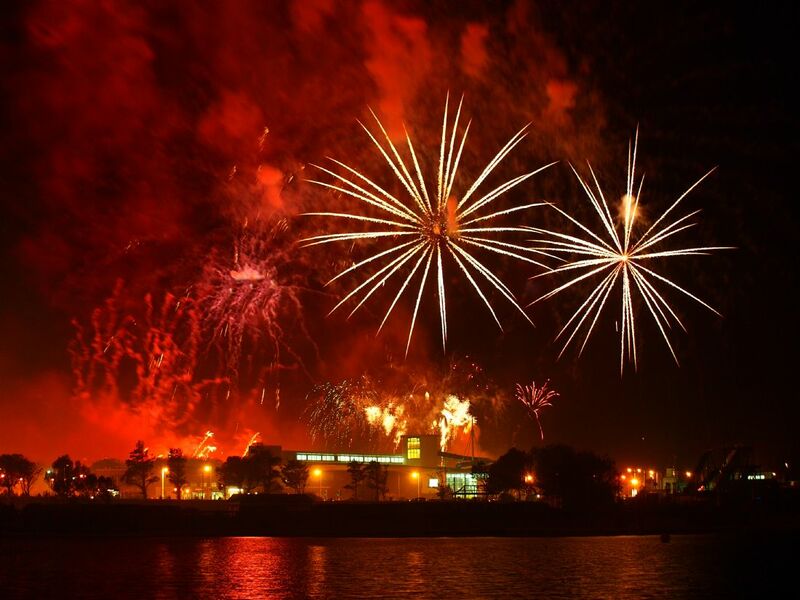 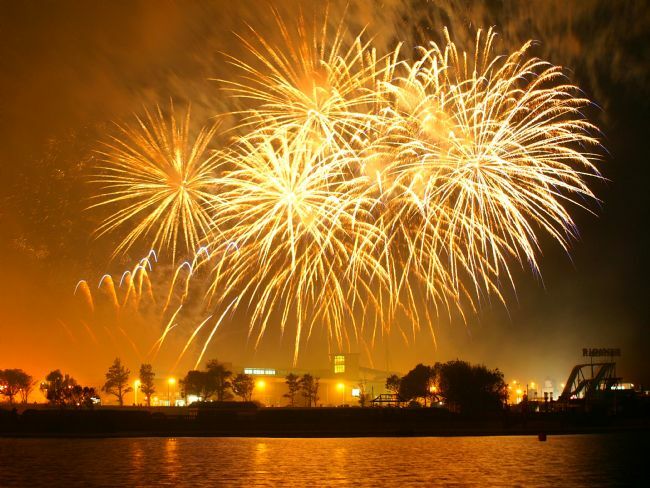 An explosion of yellow lights up the sky and smoke abve Victoria Park in Southport,Merseyside during the British Musical Firework Championships. Fireworks explode like a starburst during the British Musical Firework Championships in Southport,Merseyside. 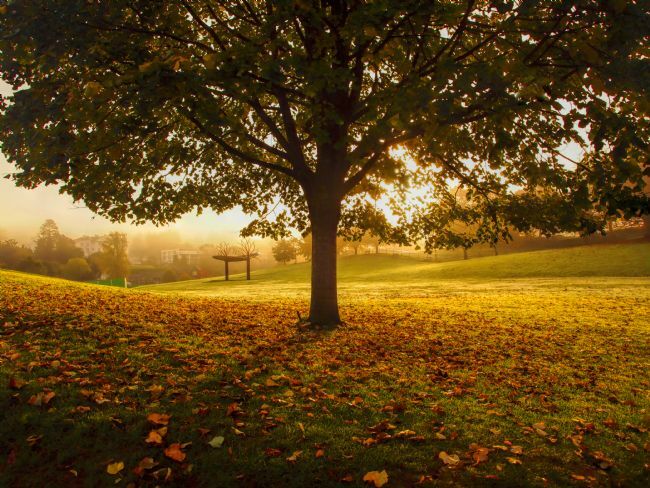 A gold carpet of autumn leaves cover the ground underneath a tree on a misty morning at Windermere in the Lake District,Cumbria. 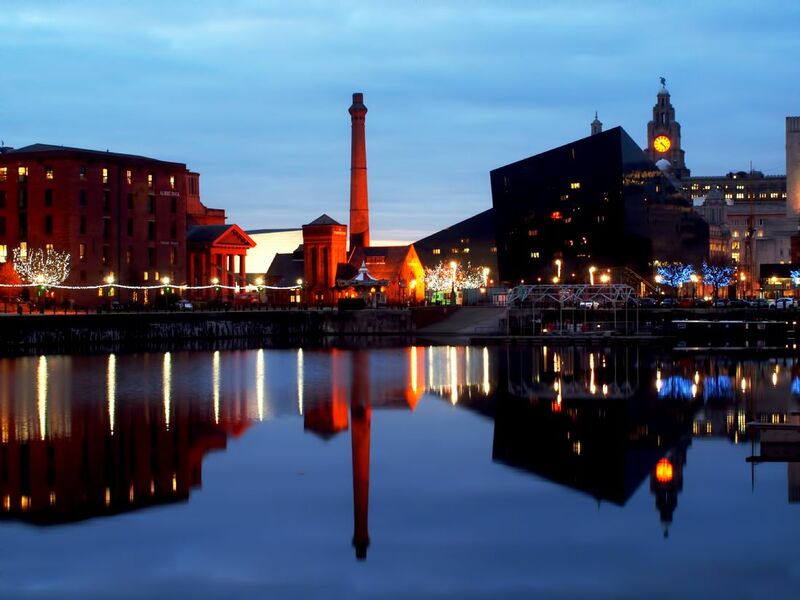 Albert Dock skyline with the Pumphouse taking centre stage in Liverpool. Taken at night, the buildings are reflected onto the water of the dock. 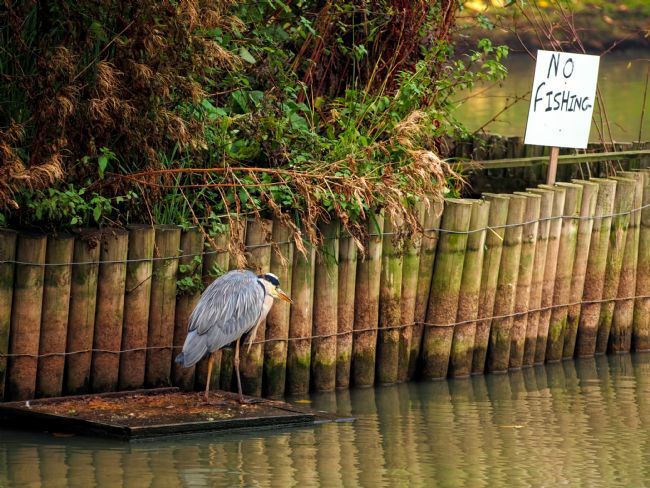 A heron lands on a landing stage to look for fish in the lake at Hesketh Park, Southport beside a No Fishing sign. 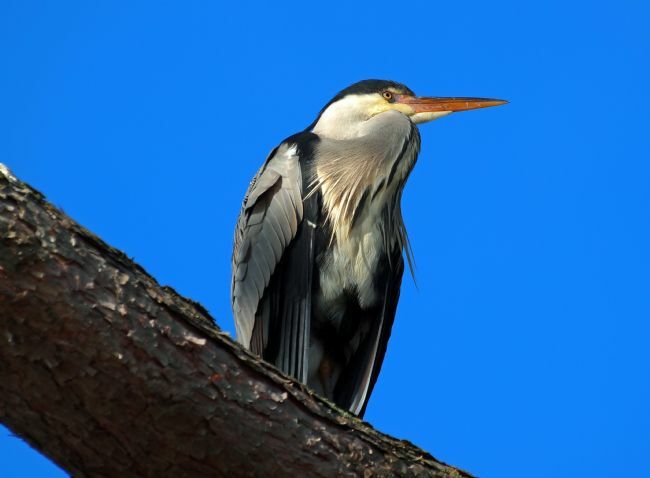 The rule obviously doesn't apply to herons! A view across Derwentwater to Catbells in Autumn with the leaves changing colour on Derwent Island. The lake is full hence the gate being in it with birds resting on the posts. A wooden rural bridge in Scarisbrick, Lancashire takes you across a brook onto farmland.Taken during sunrise on a frosty morning. Princess Diana Gardens on Lord Street , Southport, England with it's Town Gardens cafe is a lovely place to congregate in the sun and just watch the world pass by. 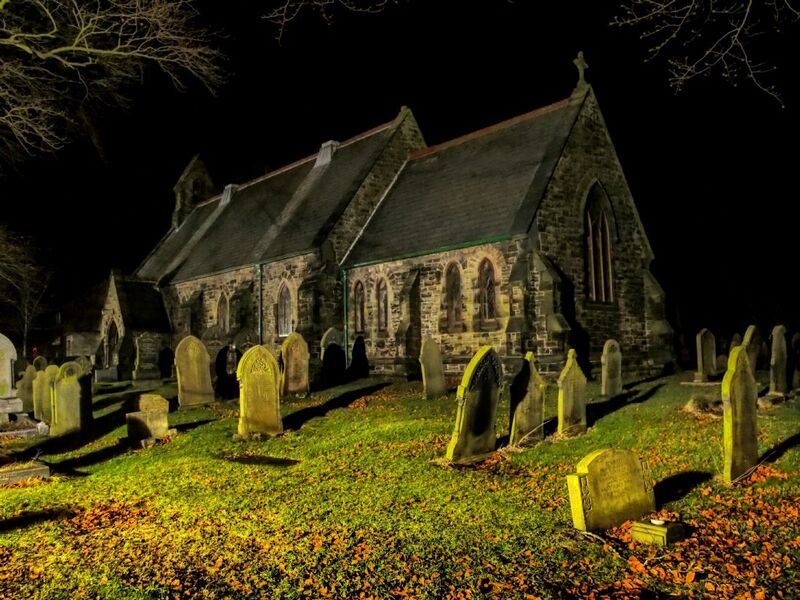 St Mark Church of England in Scarisbrick, Lancashire illuminated at night. 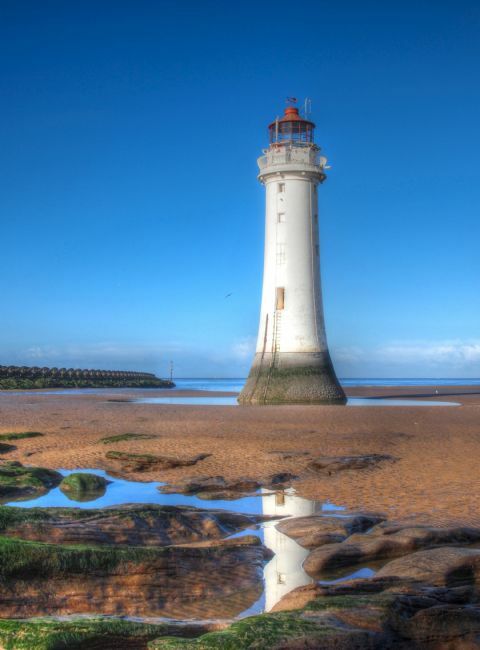 Sited on the main road near Southport, Merseyside, it has some old gravestones on the land. 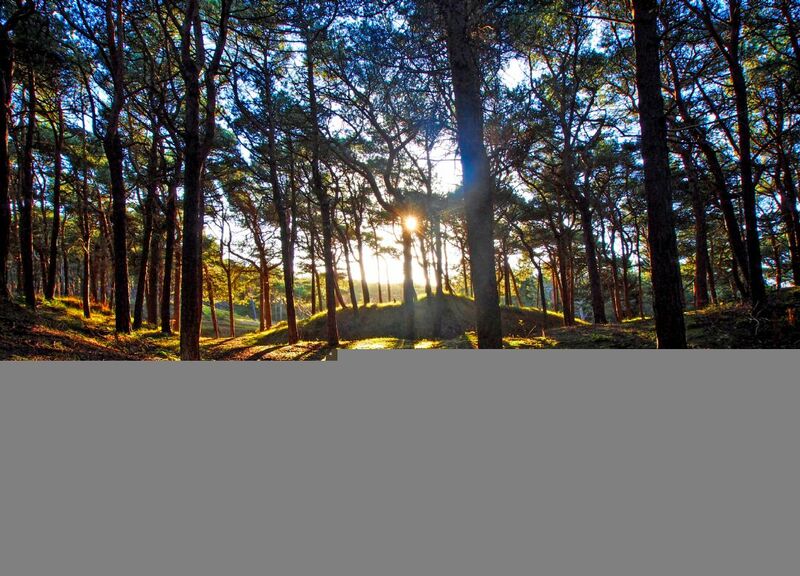 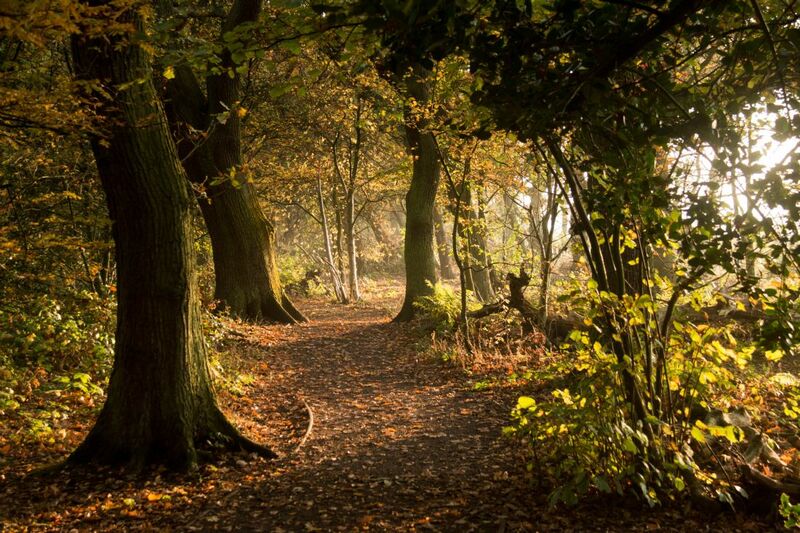 The sun filters through the trees at Formby Pinewoods on Merseyside. 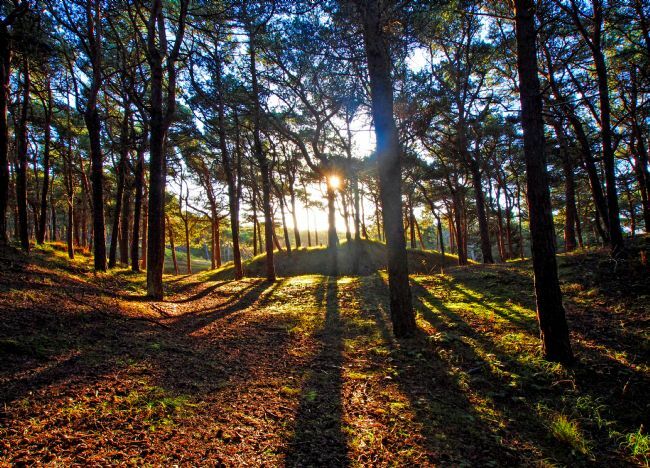 A nature reserve set among the sand dunes of Formby where red squirrels can be seen. 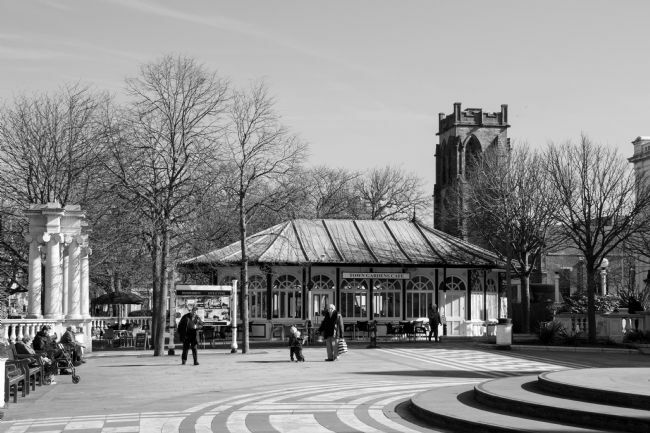 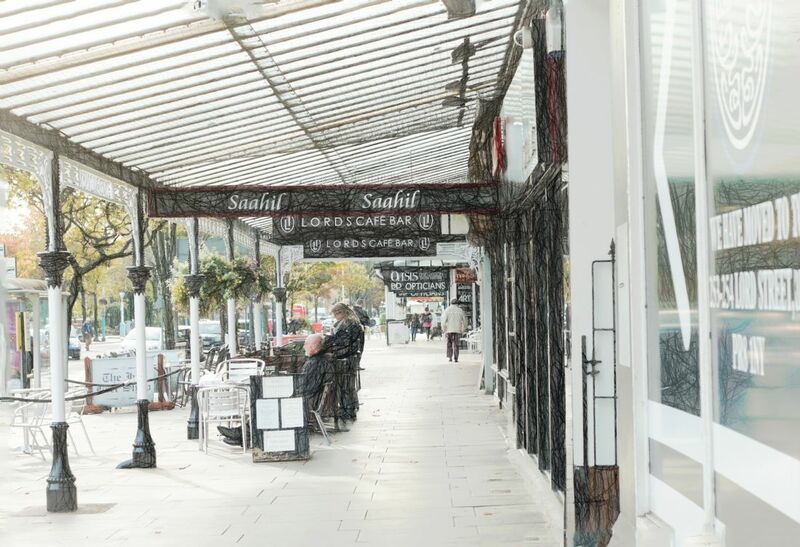 Under the canopy on Lord Street Southport are a few continental style cafes with outdoor seating. 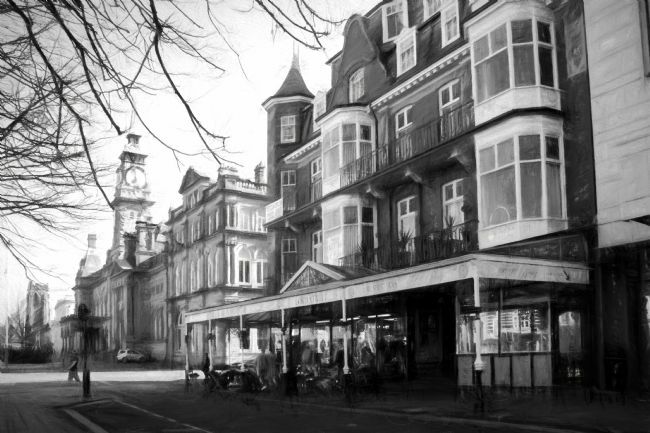 Given a pencil effect, this image ia a section of the Victorian boulevard which Southport is famous for. A cyclist on the road to Coniston in the Lake District strains to cycle uphill on the narrow lane. 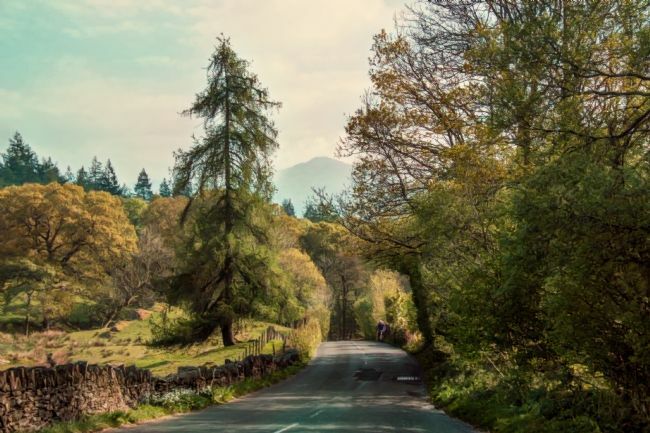 Surrounded by trees of different varieties and a stone wall lining the route, it's a beautiful view to ride through. 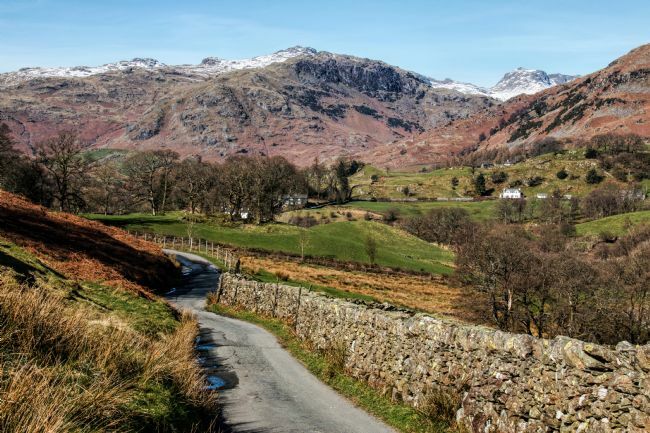 A country lane in the Langdales, Lake District that leads to Slater Bridge and the Cathedral cavern. It's a lane for walkers and local farmers on their quad bikes. 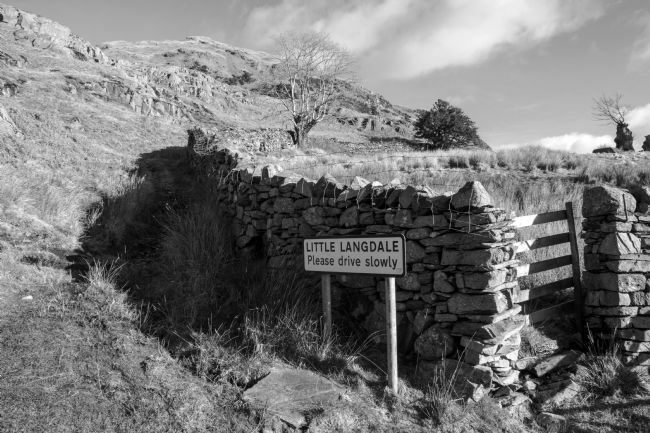 A sign asking drivers to drive carefully lets the driver know they are now in Little Langdale where the roads are very narrow with just enough room for one car. 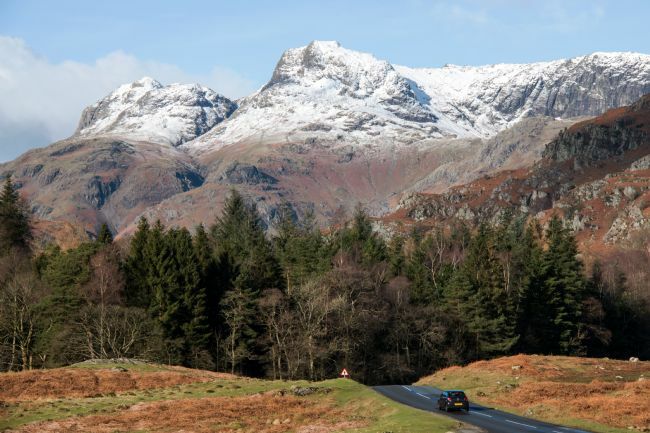 The road leads to Blea Tarn, a mass of water in the Langdale valley.A rocky outcrop, drystone walling and mountains are all characteristics of the area. 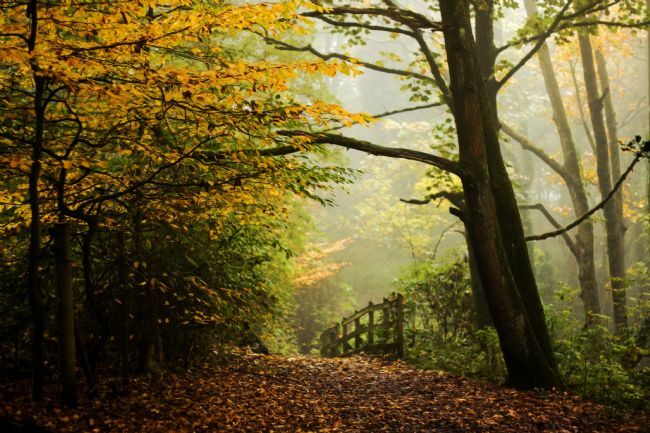 A man and his dog walks through leafy woodland near Builth Wells in Wales. The woods are connected to Fforest Fields camp site and leads to higher levels of the hillside. 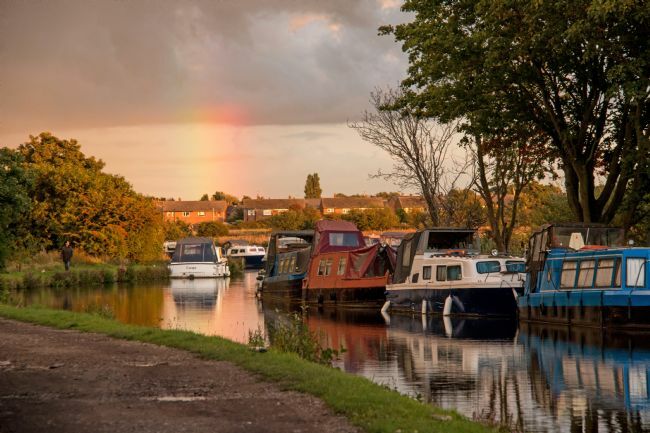 A lady walks the towpath of the Leeds/Liverpool canal near Scarisbrick, Lancashire away from a rainbow created during a rain shower. A blue iris in bloom during Spring. 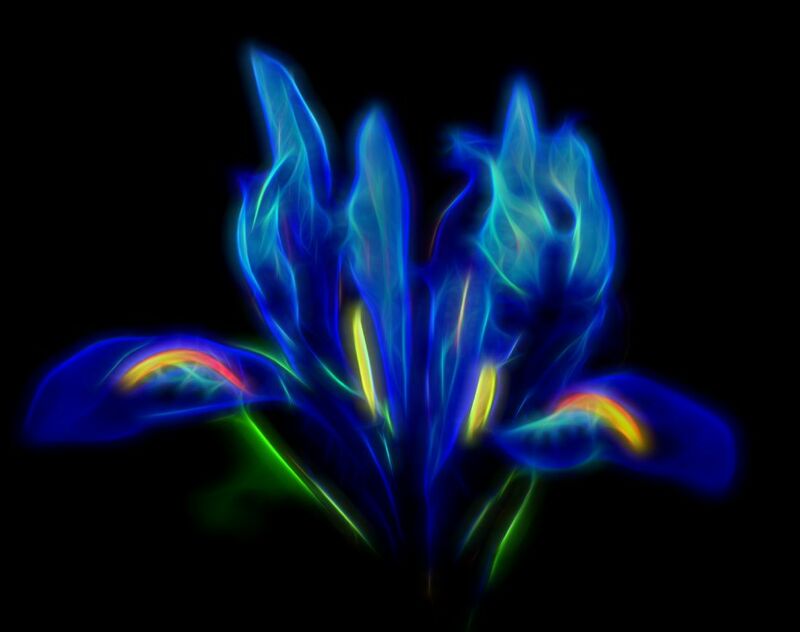 The finish of the image was done by adding a glow to it to make it look electric and with a black background. 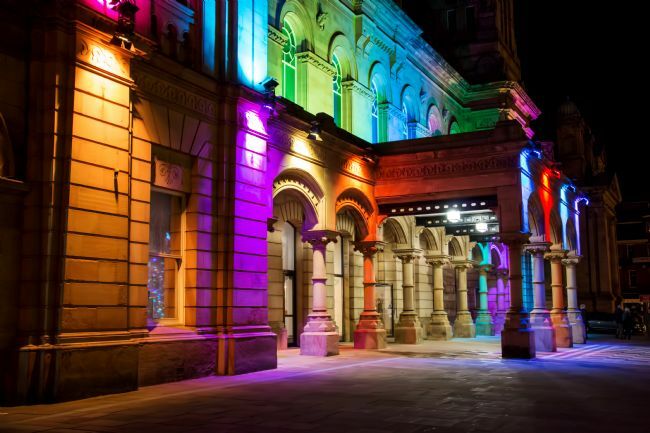 The Atkinson Gallery on Lord Street in Southport lit up in multicolours during the Southport Christmas switch on. 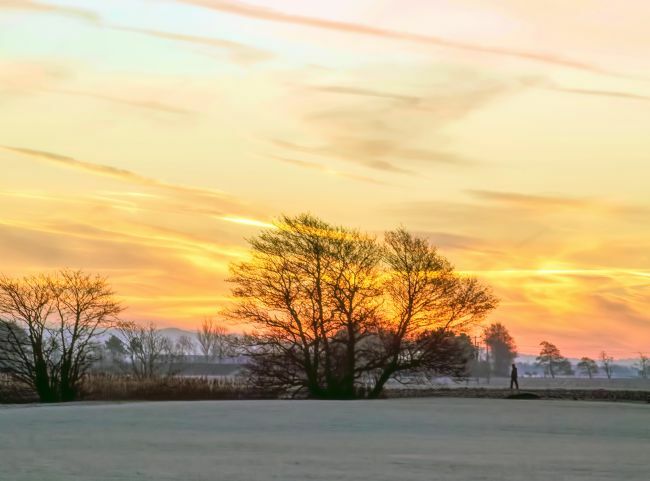 A lone walker takes a frosty morning walk through farmland in Scarisbrick,Lancashire during sunrise which leaves the sky tinged with pink. 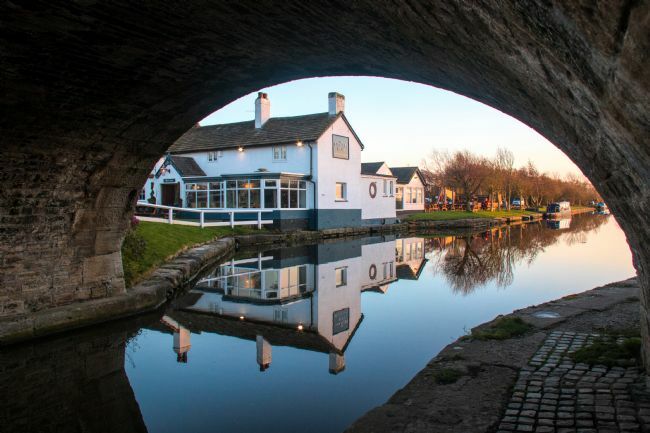 Under the bridge along the Leeds/Liverpool canal towards Halsall in Lancashire you can catch a glimpse of the Saracens Head pub reflected in the calm water. 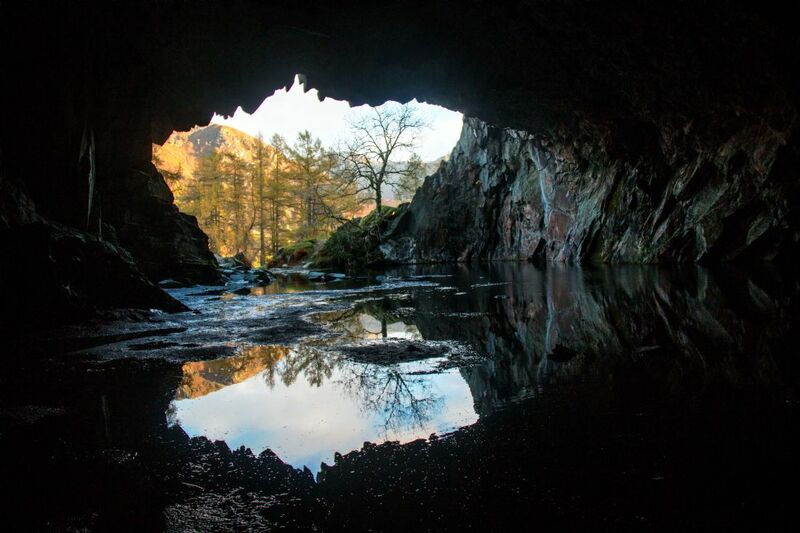 Rydal cave in the Lake District with reflections in the pool of water in the cave. 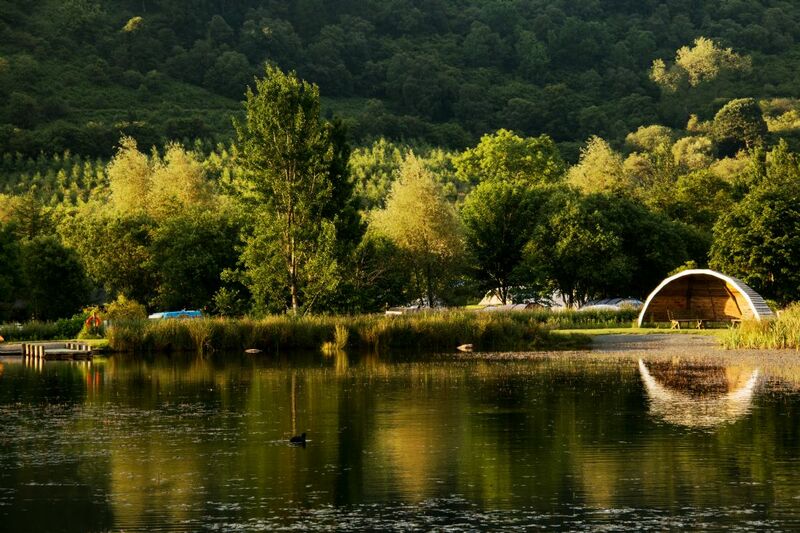 This shape of the entrance and the pool of water gives the appearance of a butterfly. 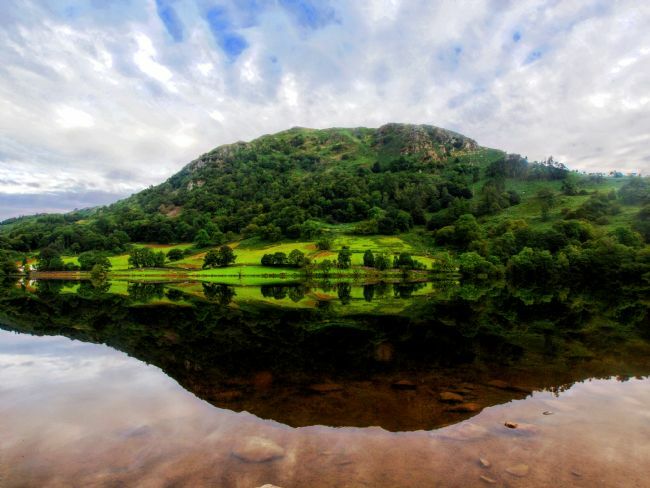 The colours in the rock are shades of red, grey and green. 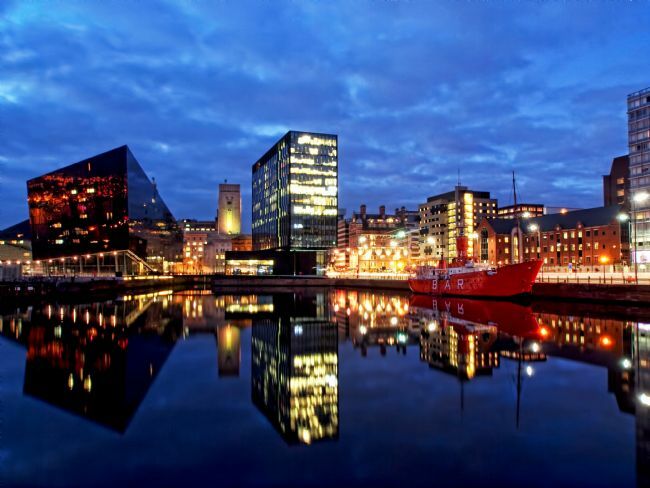 Liverpool city skyline around the Albert Dock marina showing the Pumphouse, Liverpool One, Tate Gallery and the Titanic Hotel. 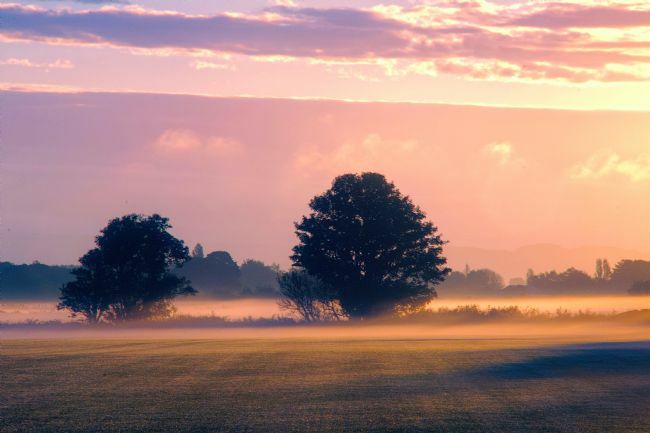 A foggy sunrise in Scarisbrick near Southport with pink mist lying on the open fields of farmland and a tree and birds silhouetted against the morning sky. 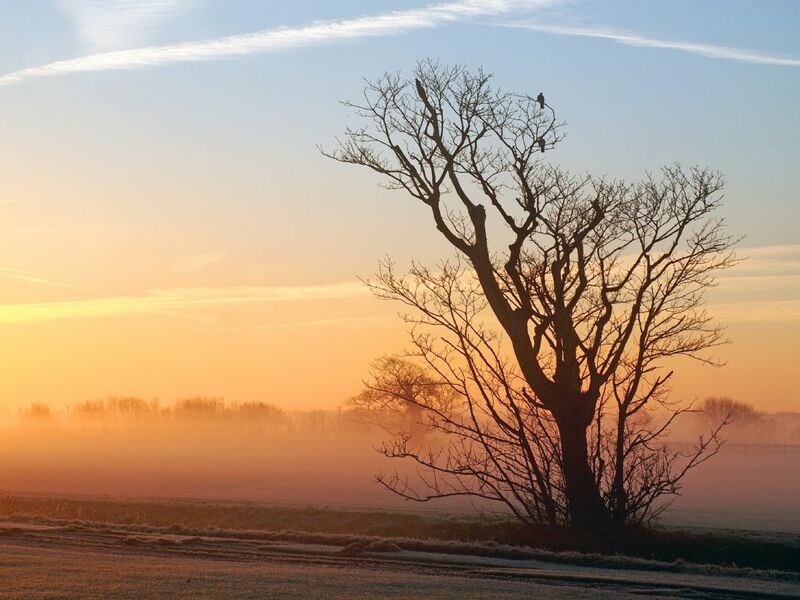 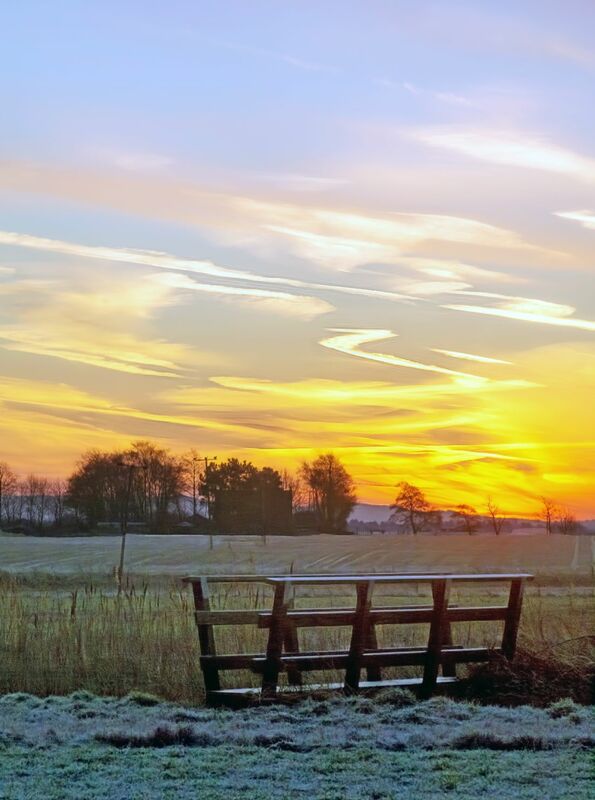 A winter sunrise over the fields of Scarisbrick near Southport with a low mist hanging over the farmland. 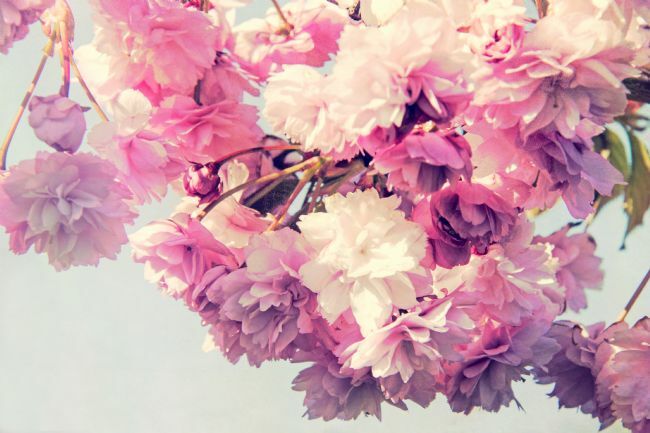 Pink blossom from a flowering cherry tree in Spring given a hazy dreamy effect. 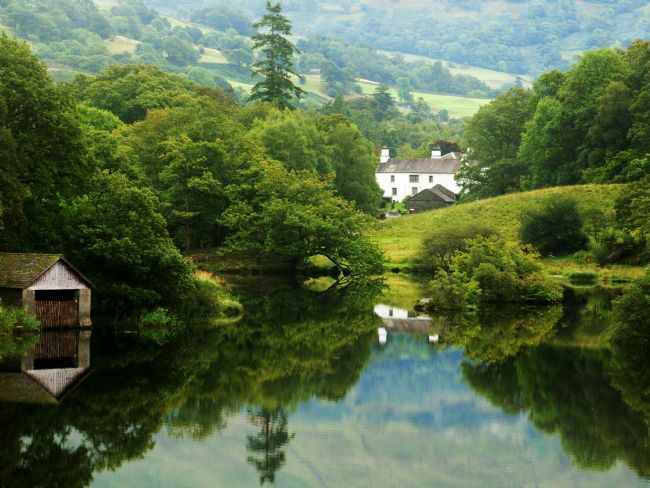 Rydal reflections during late summer on a calm morning at Rydal Water in the Lake District,England. 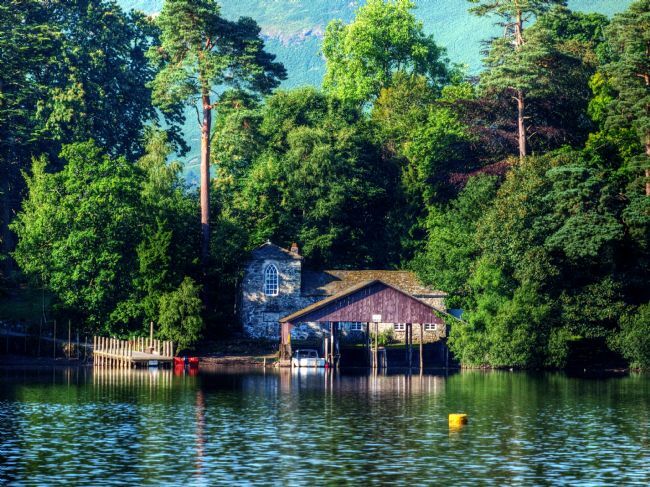 A mass of greenery from the trees surrounding the boathouse looks as though it is painted on glass. 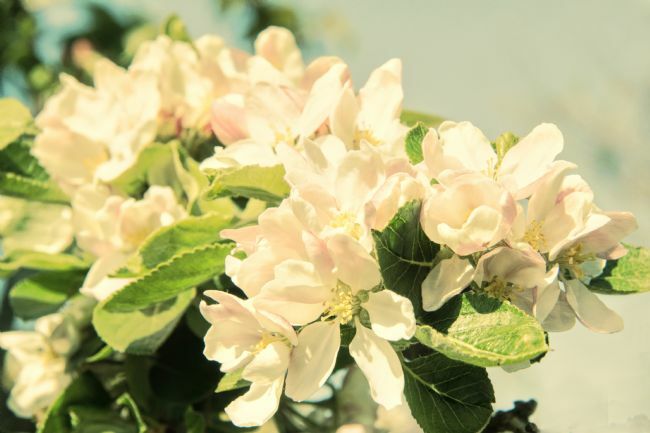 Apple blossom bursting into bloom heralds the start of Spring and the promise of a bumper crop later in the year. 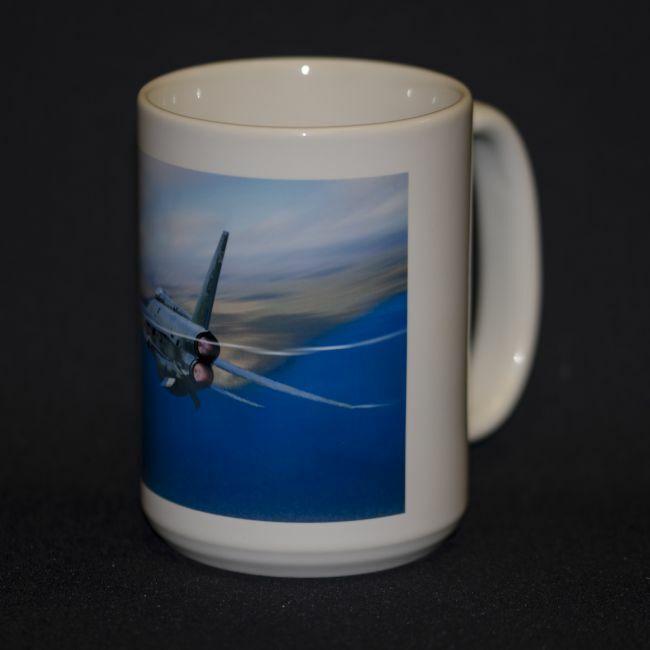 Image given a faded effect. 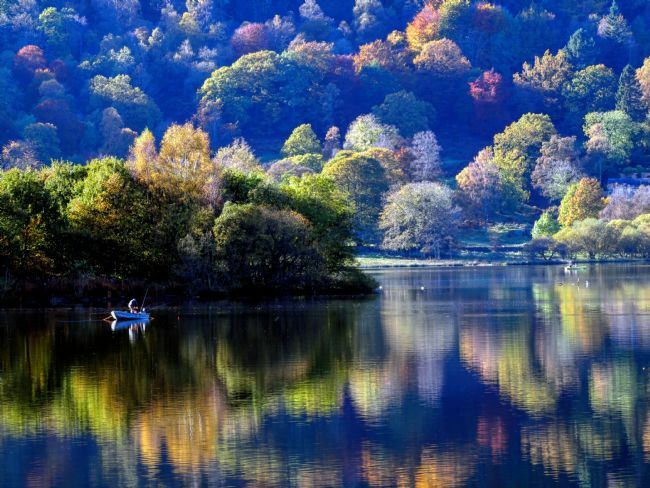 A solitary angler in a rowing boat on Grasmere lake in the Lake District, Cumbria is surrounded by autumn colour on the trees which is reflected onto the water. A misty morning in Scarisbrick, Lancashire across farmland during winter. 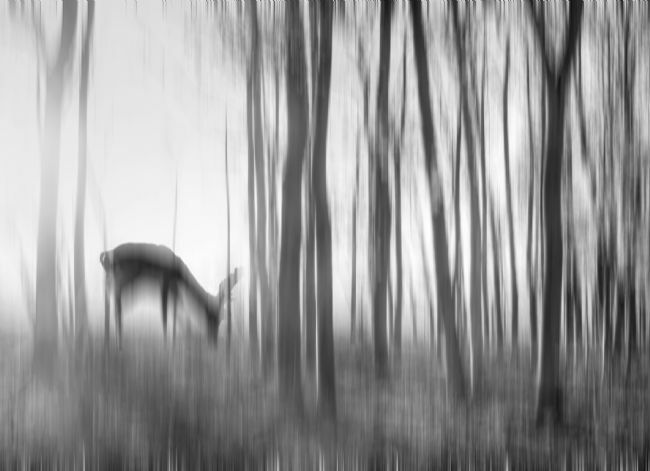 A blend of two photographs to give the viewer the feeling that they are seeing a mirage of a deer through the trees.The images were taken in Scarisbrick,Lancashire and at a deer park. 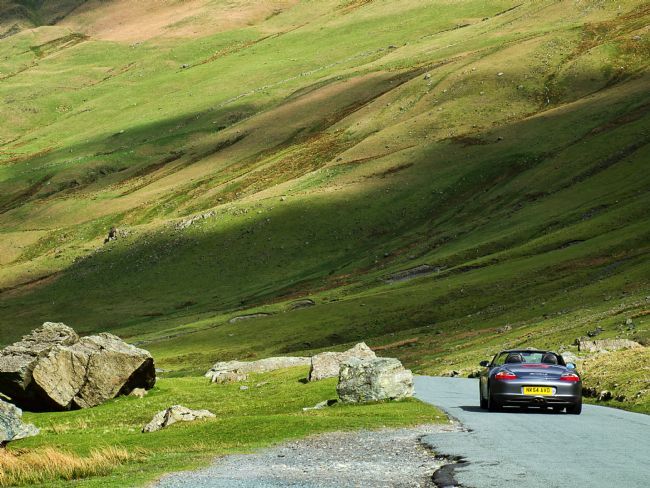 A car meanders it's way down the steep and winding road of Honister Pass through the mountains of the Lake District towards Buttermere. 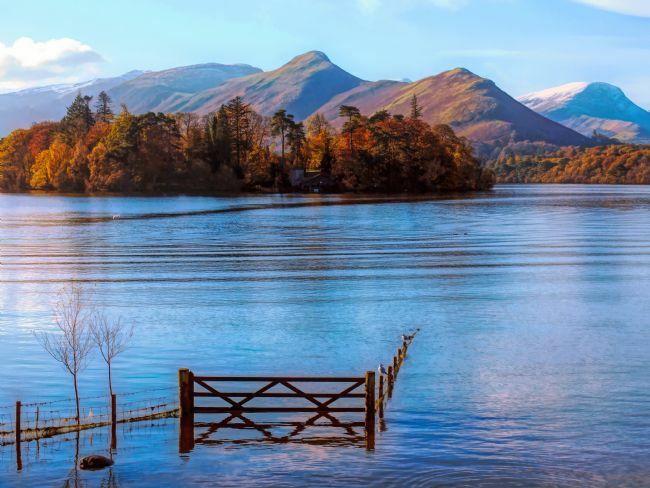 Catbells and Derwentwater in the Lake District during the Autumn season when the colours glisten in golds and burnt orange.The colours reflect on the lake giving the image a warm effect. 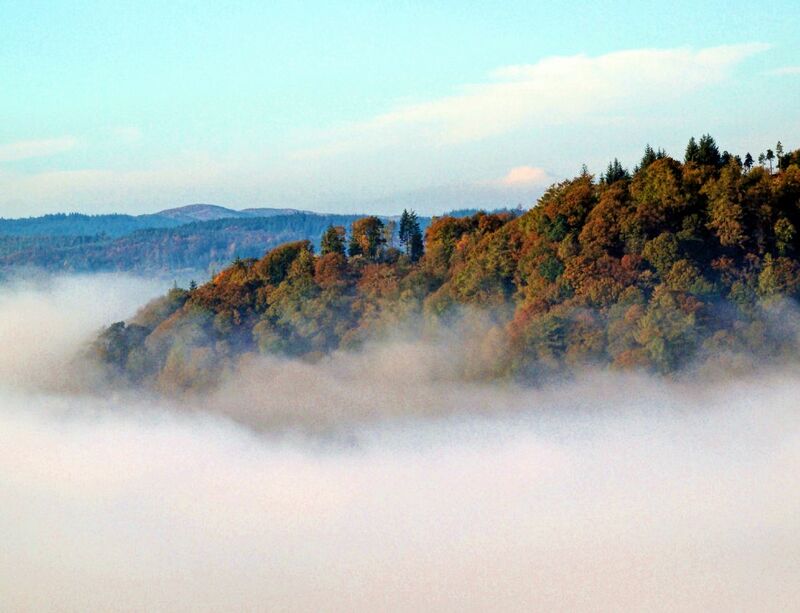 A walk up Brant Fell to look over Windermere during Autumn revealed this cloud inversion with the tops of the trees poking through in their autumn colours. 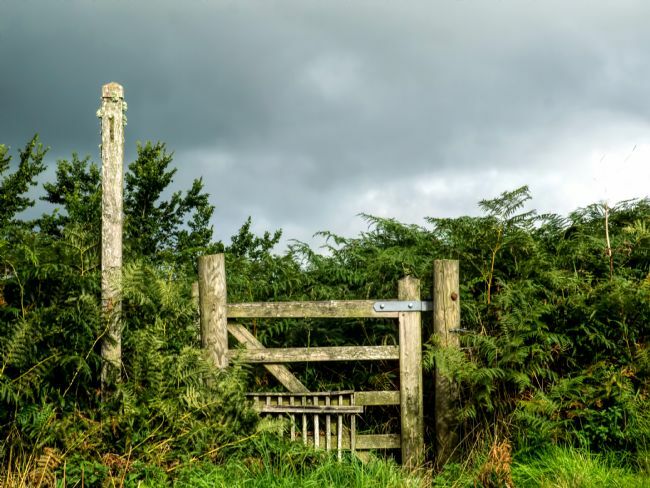 The wooden gate nestled among ferns above Llandrindod Wells in Wales leads a walker to the hills surrounding Llandrindod where magnificent views can be seen. 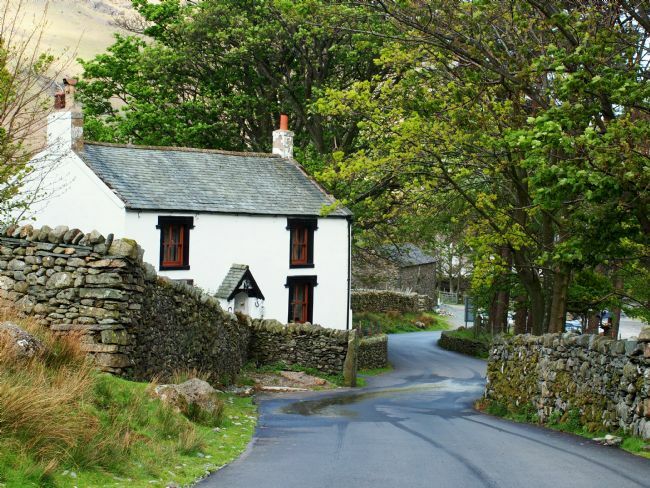 A rural lane at Llangynhafel in Wales leading to a farmhouse where children were evacuated to during WW2 . 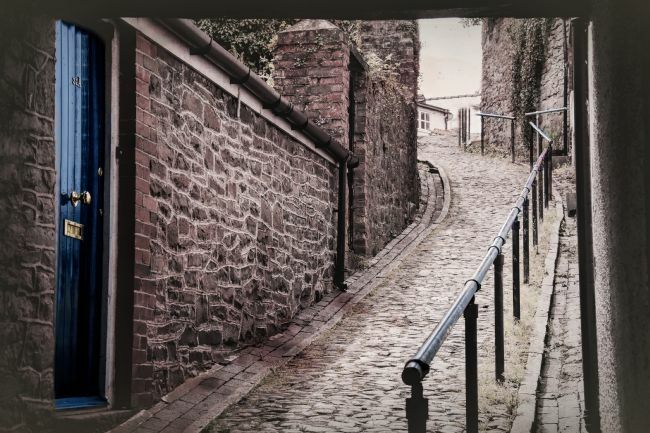 A narrow lane with room for just one vehicle to travel along. 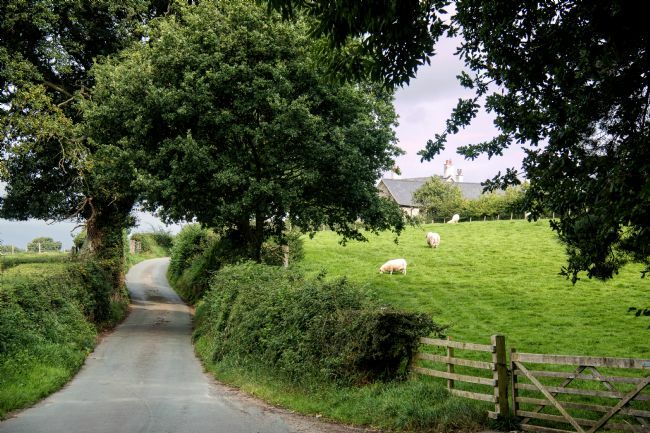 The image is typical of country scenes through Wales. 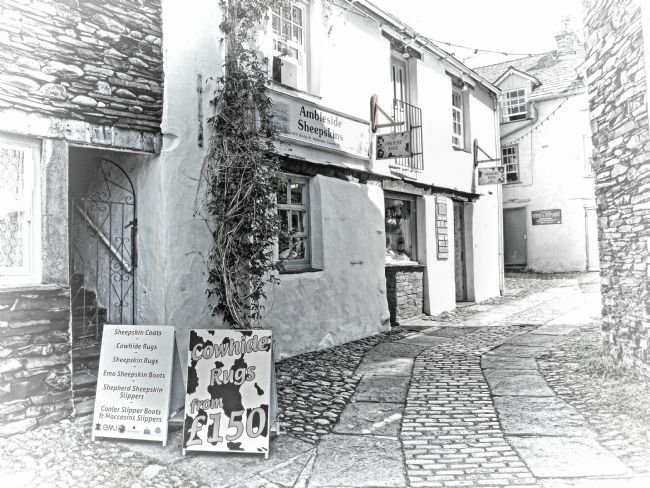 A cobbled alleyway in Ambleside, Lake District reveals a couple of shops and a gated stone staircase.It makes a walker feel the need to explore further. Forest greenery reflected in the lake at Fforest Fields Caravanning and Camping Park in Wales. 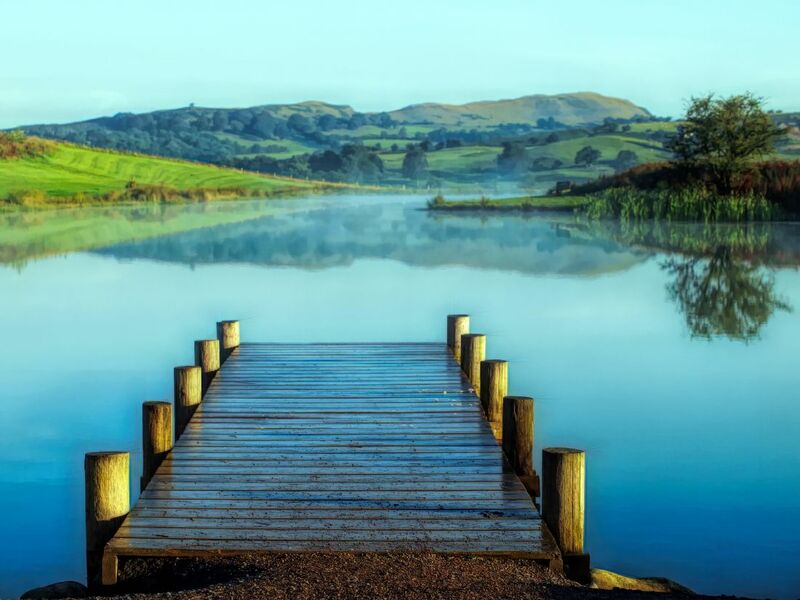 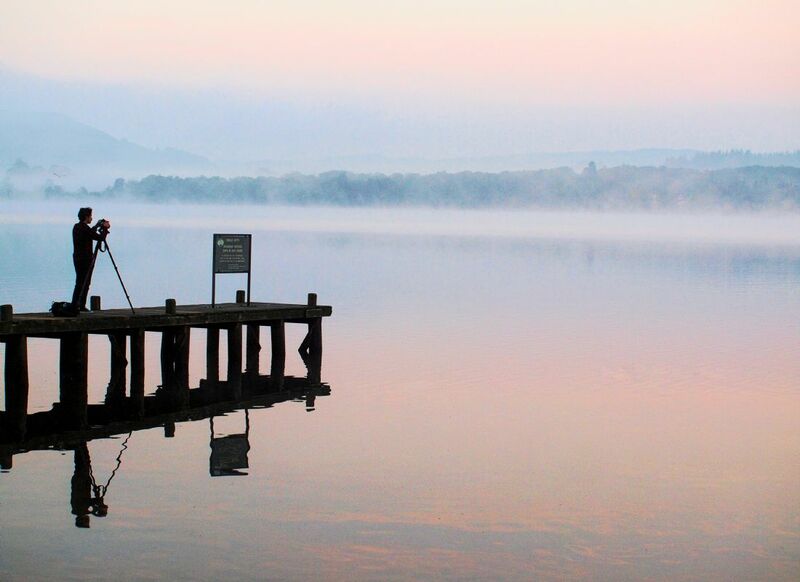 The jetty, shelter and coot all adds to the atmosphere of a calm summery morning before the world wakes up. Fforest Fields jetty in Wales one early misty morning when there are no swimmers or kayakers around.It's a perfect place to admire the view of the surrounding hillside. A panoramic view across the marine lake in Southport of the old and modern bridges which are reflected in the calm water. A line of swan pedaloes take centre stage ready for tourists. The old part of Churchtown in Southport with shops,fishermen's cottages,pubs and churches shows of bygone times when this area was a small village for fishermen. 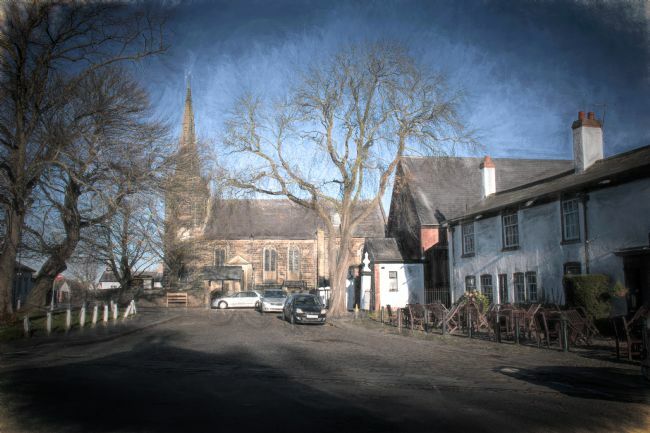 This scene shows St Cuthbert's church and The Hesketh Arms pub and it has been given a slight painted effect. Woodland at Meresands nature reserve in Rufford as the sun was setting low in the sky and filtering through the trees lighting up the autumn leaves. 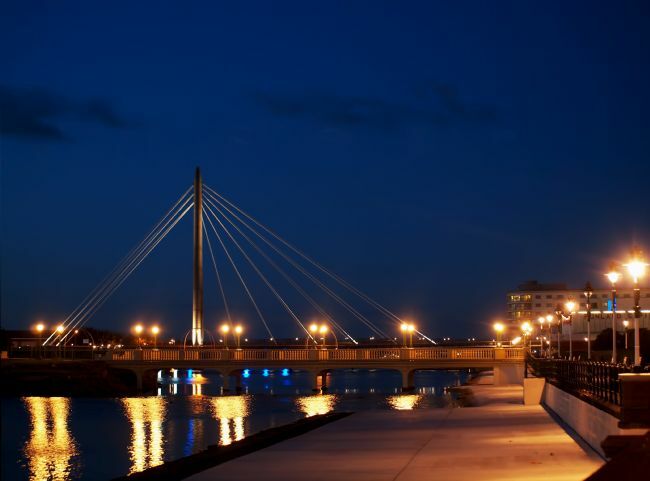 The newly restored area around the marine lake in Southport, England at night lit up with the Millenium bridge in the background. 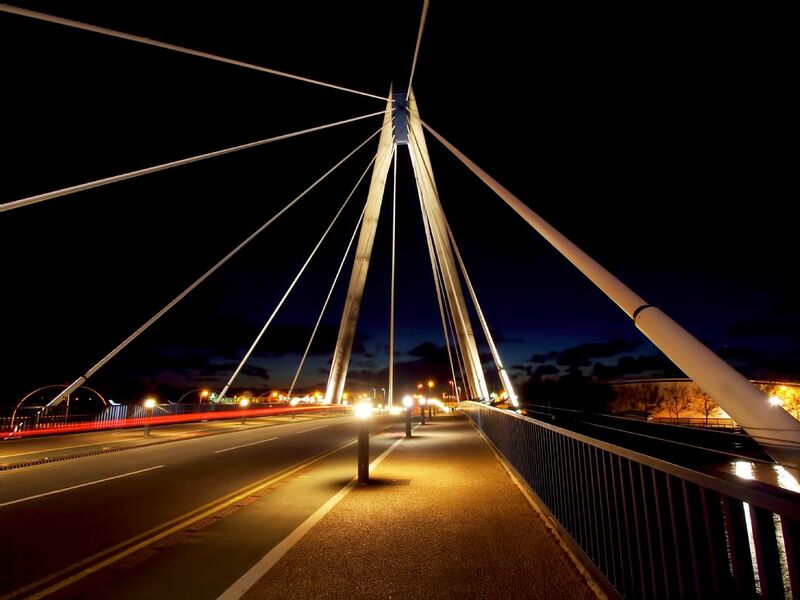 The Marine bridge that crosses over the marine lake in Southport,Merseyside,England lit up at night with car trails passing through. 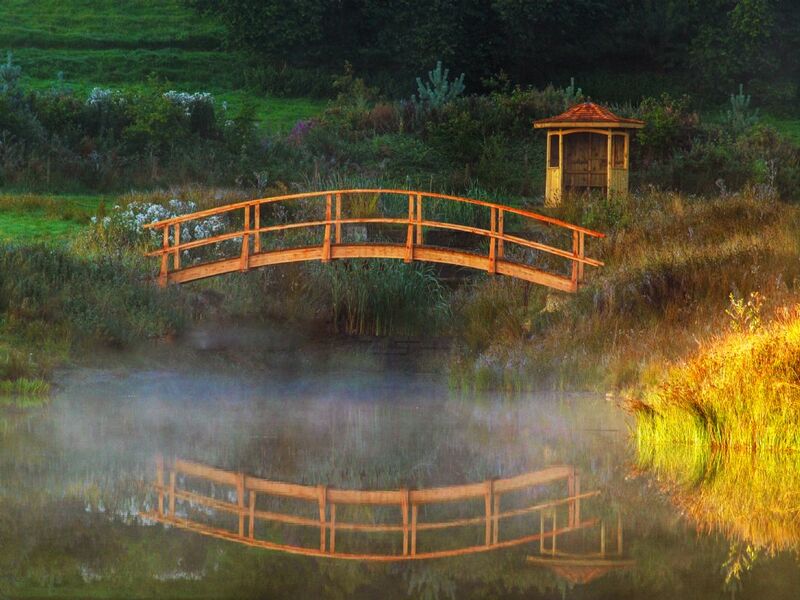 A wooden bridge, gazebo and reflections in the mist one morning at a campsite in Wales giving an oriental feel to the atmosphere. 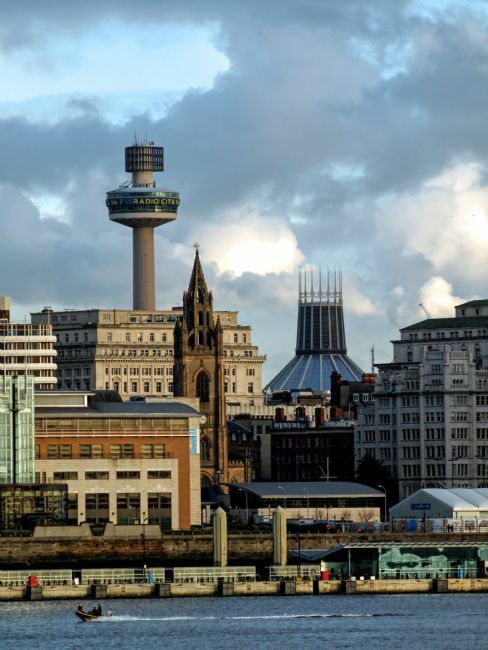 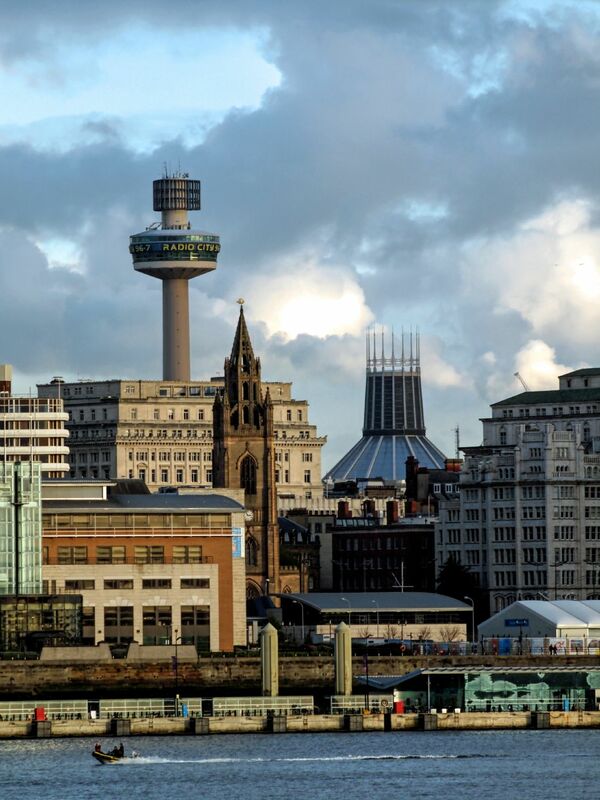 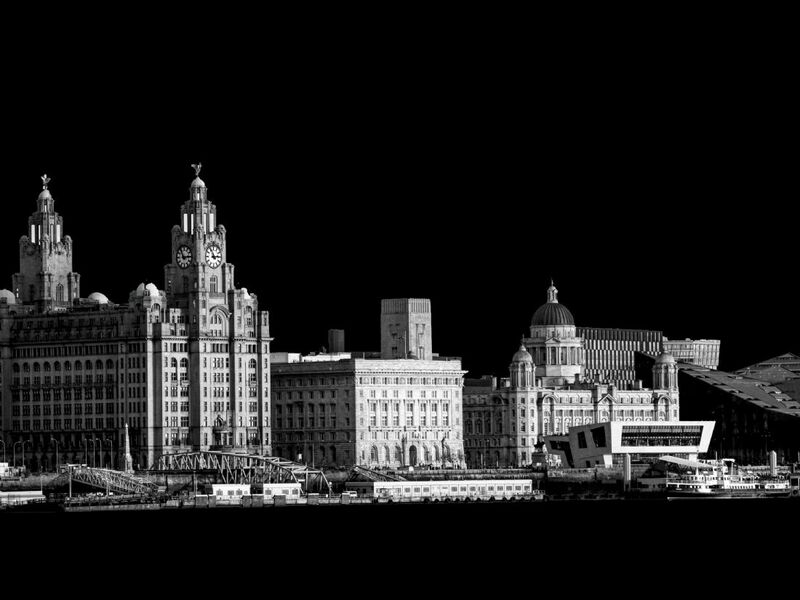 City architecture dominates the Liverpool skyline from the River Mersey with the Radio City tower,Metropolitan cathedral and the St Nicholas church in view. 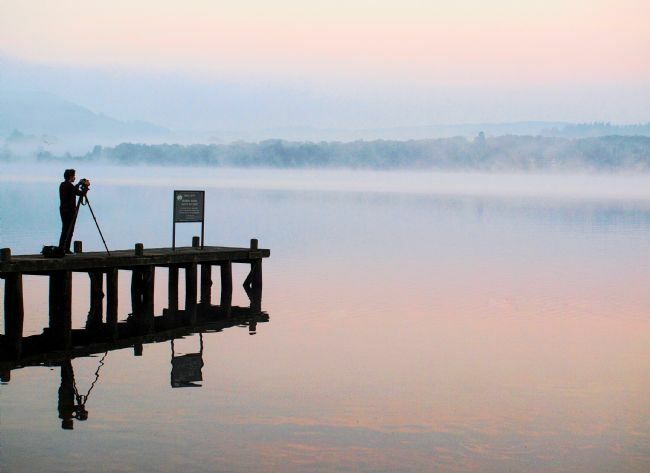 A silhouette of a photographer on a jetty at Ambleside,Lake District early one misty morning, one of the few people out and about capturing images of the beginning of the autumn season. 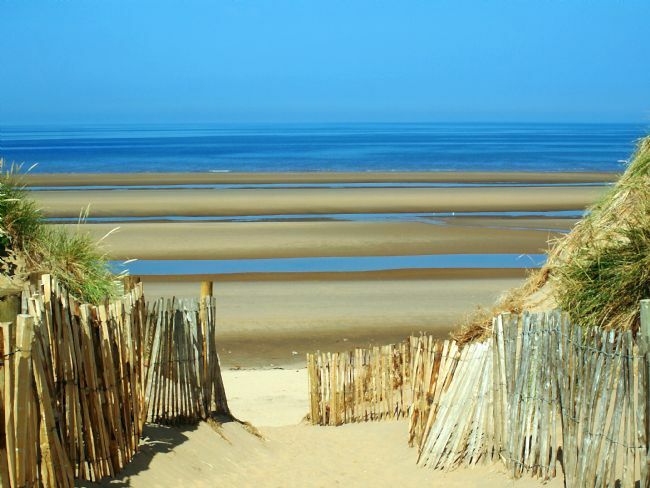 A view of the coastal defence along Southport,Birkdale,Ainsdale and Formby beach in North West England. Sand dunes stretched as far as the eye can see protecting the land from high tides. View over Rydal Water in the Lake District, England one early morning when the sun lit up a section of the fell, creating an eye of a needle effect with the help of reflections. 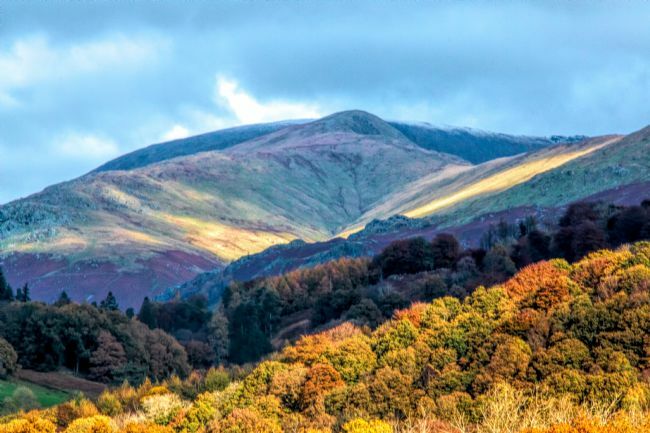 Looking towards Skiddaw from the Castlerigg Stones near Keswick in the Lake District during winter when the tops have a dusting of snow. 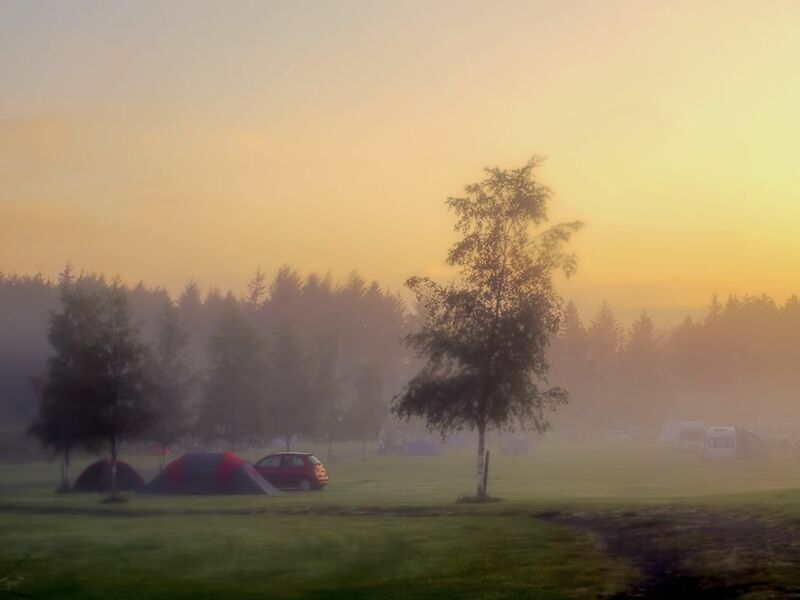 A misty morning sunrise appears over campers in tents at Fforest Fields in Wales. 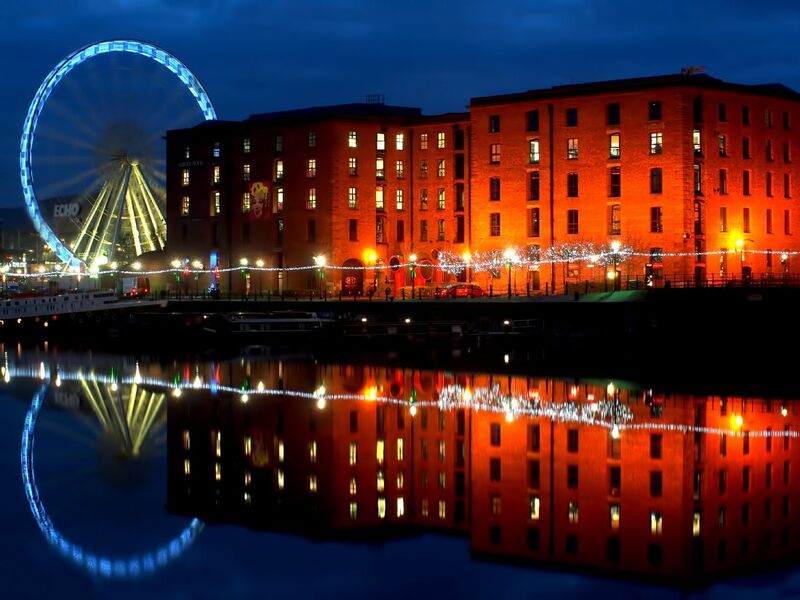 Albert Dock,Liverpool illuminated at night with the ferris wheel spinning round in the background and reflected in the calm water of the dock. 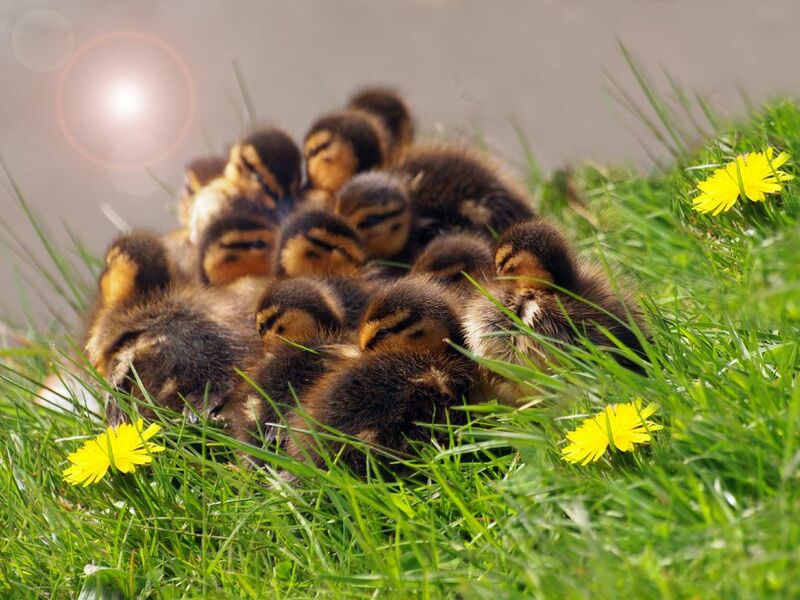 A brood of fluffy ducklings huddle together on the bank of the Leeds/Liverpool canal in Burscough, Lancashire. 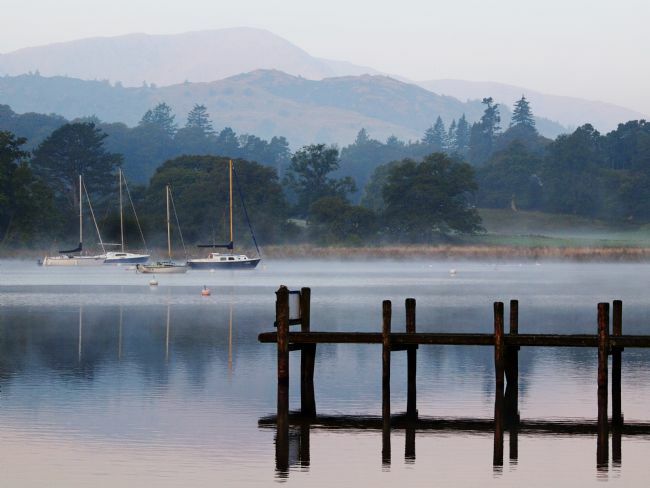 A misty morning at Ambleside in the Lake District with reflections from the jetty,boats and fells. 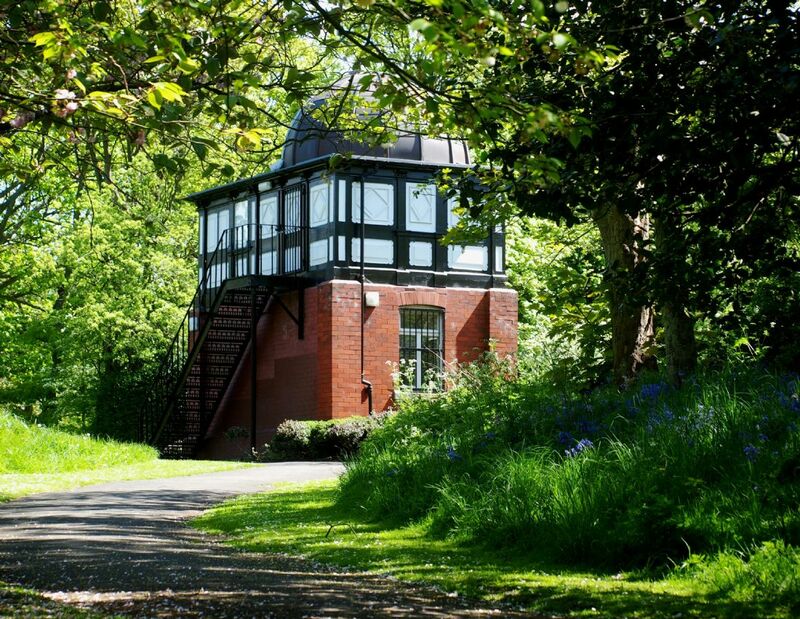 An observatory is sited on a hill at Hesketh Park, Southport , England overlooking the spring flowering bluebells. Autumn tapestry on the shores of Grasmere in the Lake District with the colours of the trees reflected in the calm water as a bird stands alone on a boulder. A welsh cobbled street in Builth Wells ,Wales takes the pedestrian away from the main high street and up a side street. A colour pop effect given due to an eye catching blue door. 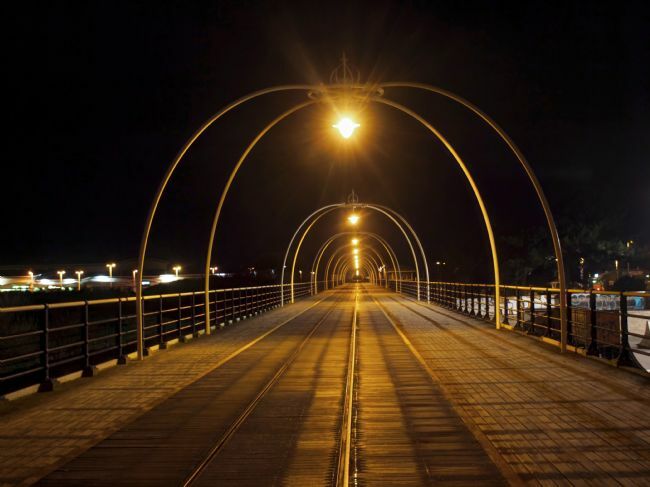 Southport pier at night with a lack of crowds and transport. The lights on the arches twinkle above the tram track. 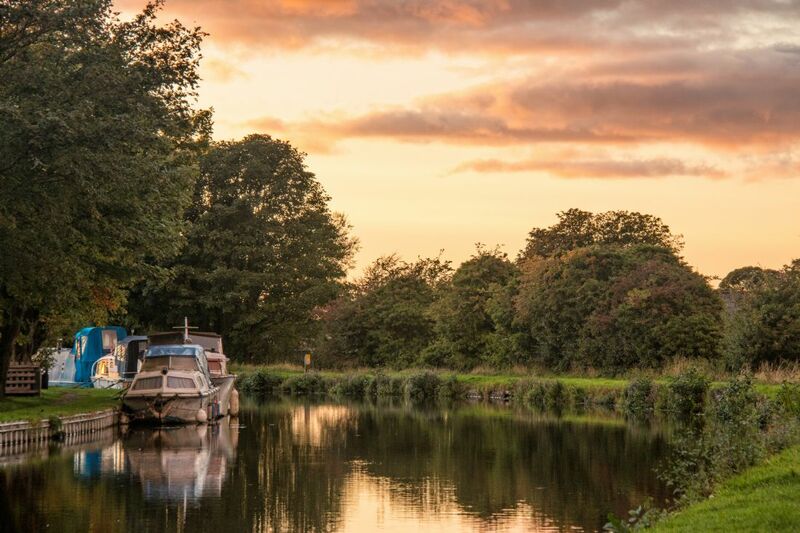 The Leeds/Liverpool canal at sunset when a storm was brewing near Scarisbrick, Lancashire. 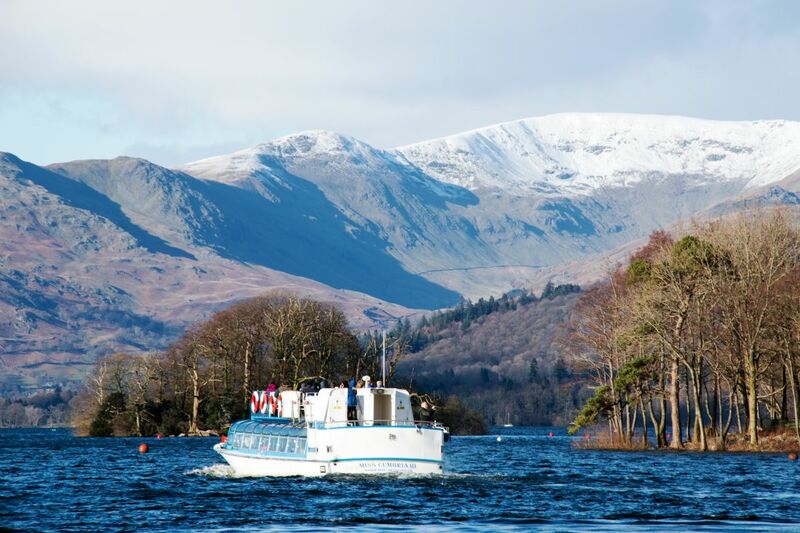 A cruise on Windermere in the Lake District on a cold winter's day with snow capped mountains in the distance. 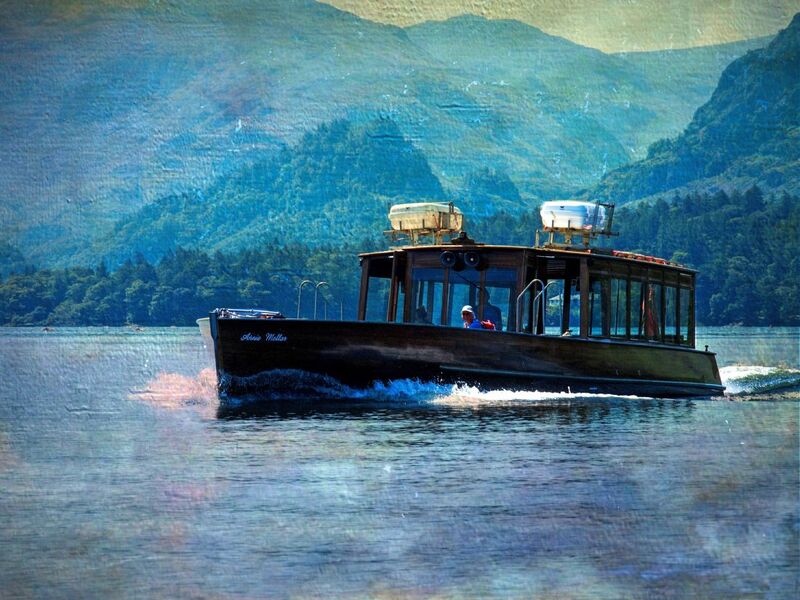 The Annie Mellor boat cruise on Derwentwater near Keswick in the Lake District takes tourists from Keswick to various landing points around the lake. 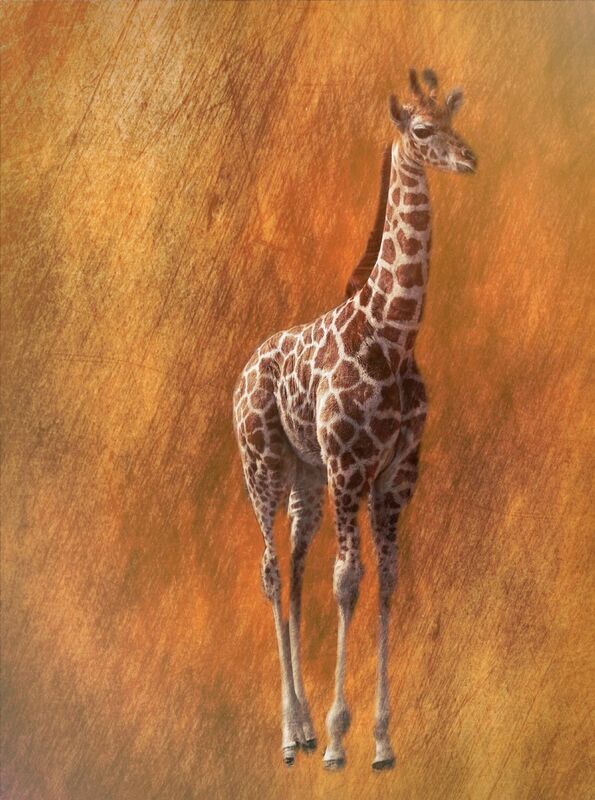 Image done in a textured effect to give a painted canvas look. 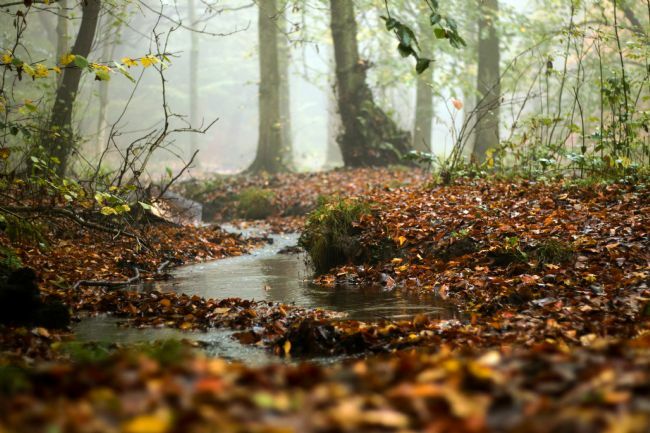 The woods at the Fairy Glen in Parbold during Autumn with a golden carpet of leaves on the ground and a hint of mist through the trees. 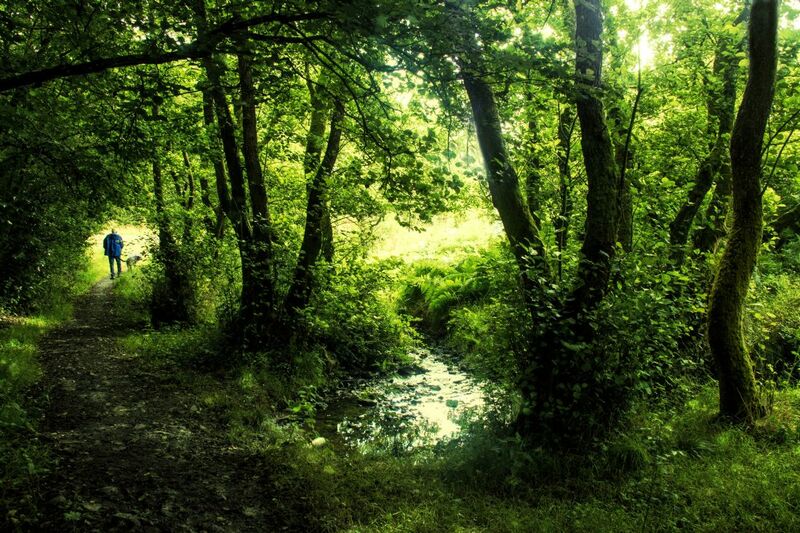 A trickling stream runs through the Fairy Glen in Parbold, Lancashire. 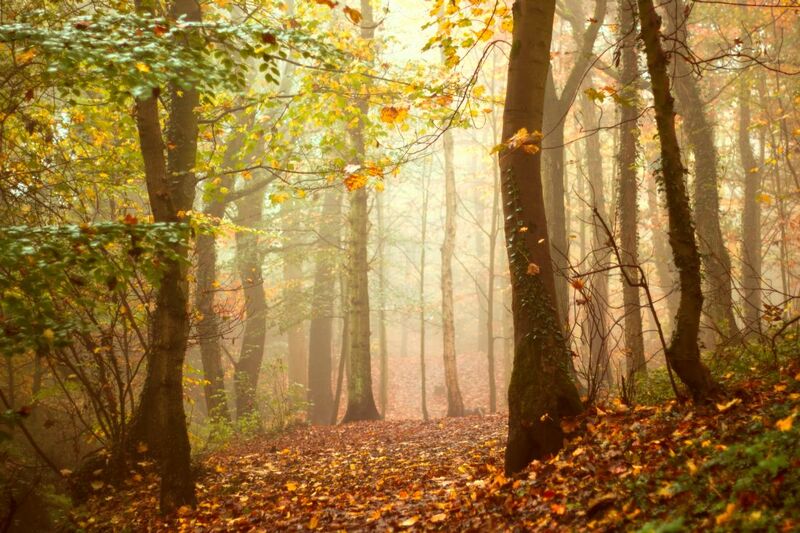 The Autumn leaves have fallen to carpet the ground in yellows and golds. 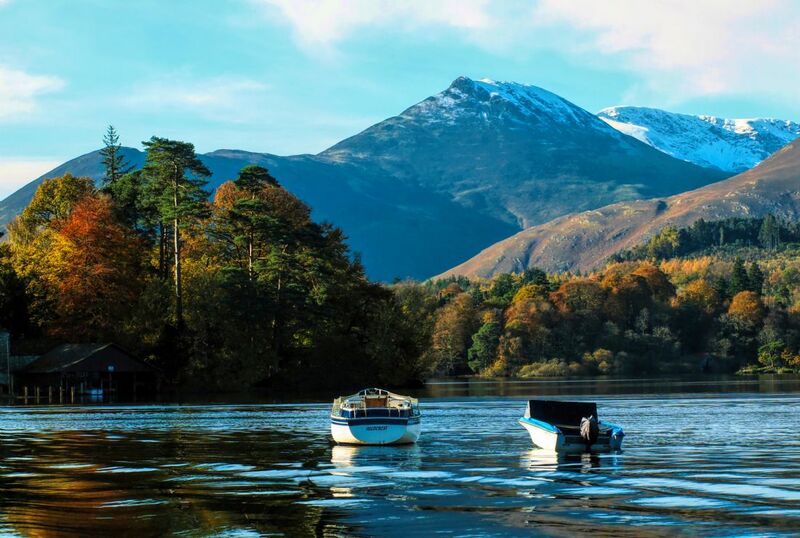 A panoramic view of Derwentwater near Keswick in the Lake District with Catbells in the background. A small boat moors in the water that looks green due to the reflections from the trees. 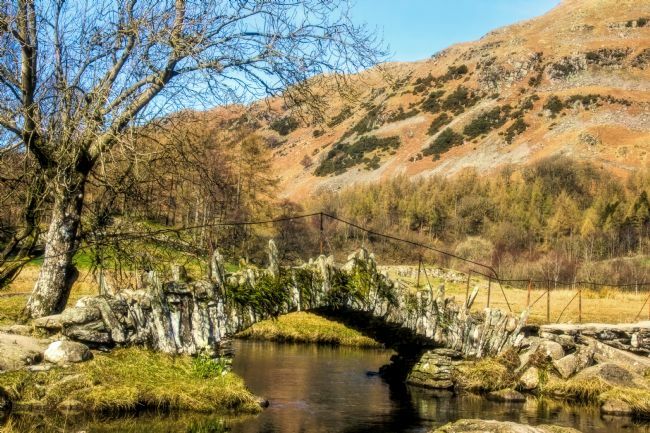 Slater bridge in the Langdales, Lake District is probably one of the most photographed bridges in the United Kingdom. It is an ancient packhorse stone bridge that crosses the river Brathay andwas probably used by miners who were working in the local Cathedral Quarry slate mine. A shipwreck named the Star of Hope appears after storms move the sandbanks on the shores of Ainsdale beach near Southport, Merseyside. 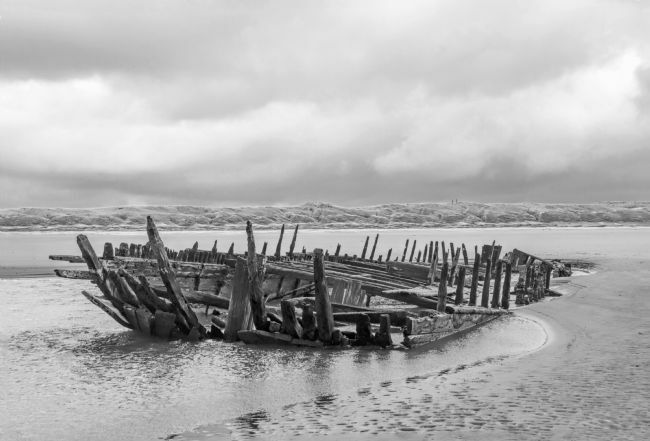 Some years the shipwreck is completely covered and visitors are none the wiser as to what lies under the surface. A tall ship is moored at Albert Dock, Liverpool near the old pumphouse which is now a restaurant. 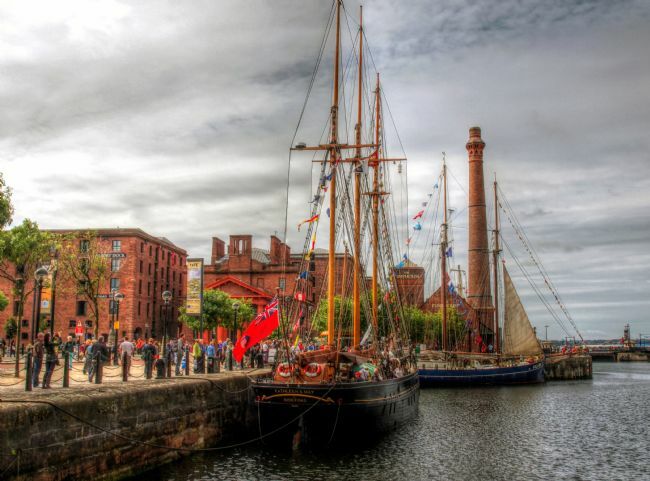 Visitors often admire the tall ships and on occasion can go on deck. 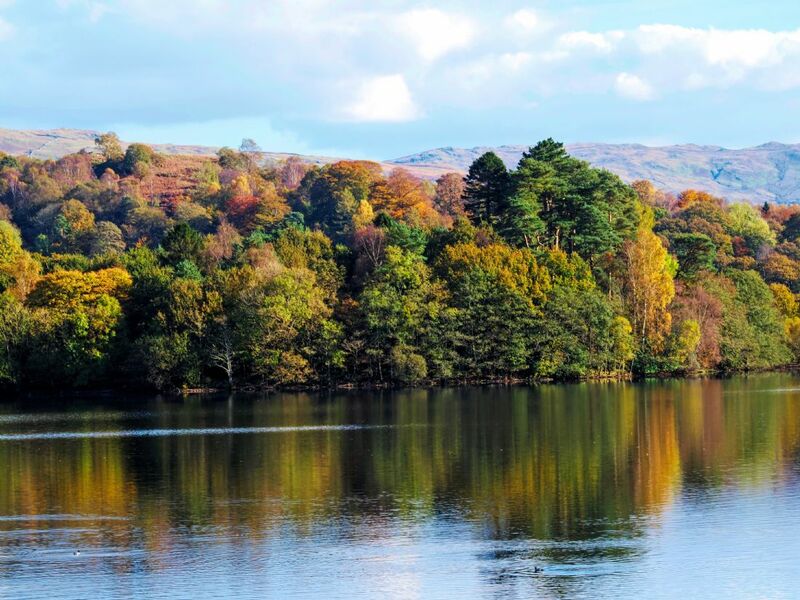 A view over Grasmere from Loughrigg during the Autumn season on a calm day when the reflections show on the mere. The stone walled enclosure of the Castlerigg stones at Keswick, surrounded by fells and mountains where sheep graze in Cumbria. 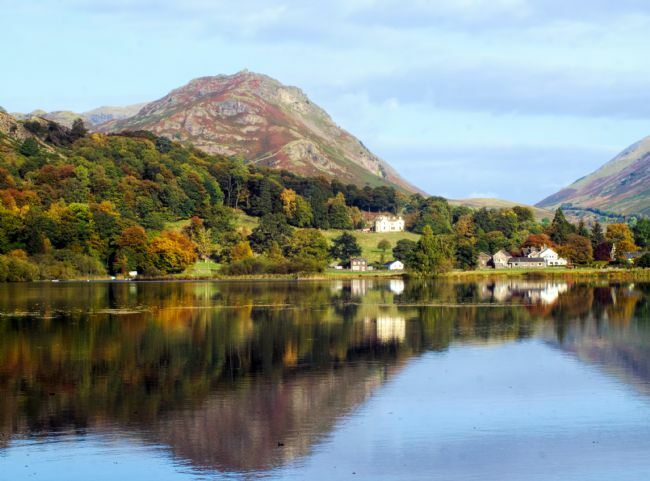 A mountain backdrop encloses the area. 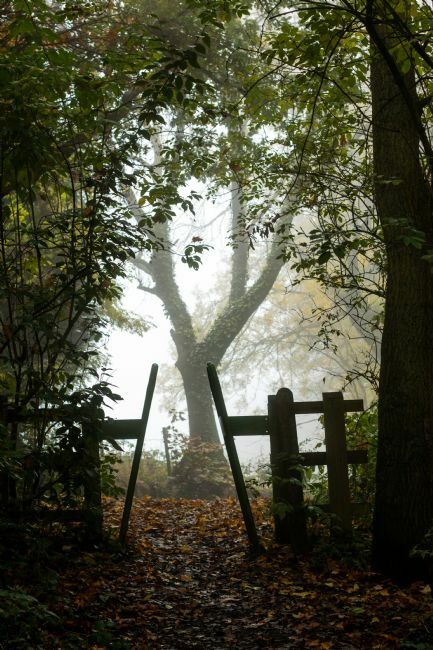 The wooded Fairy Glen in Parbold, Lancashire during a misty morning has the exit silhouetted against a tree in the mist. The shape making it look like a ladder to climb the tree. 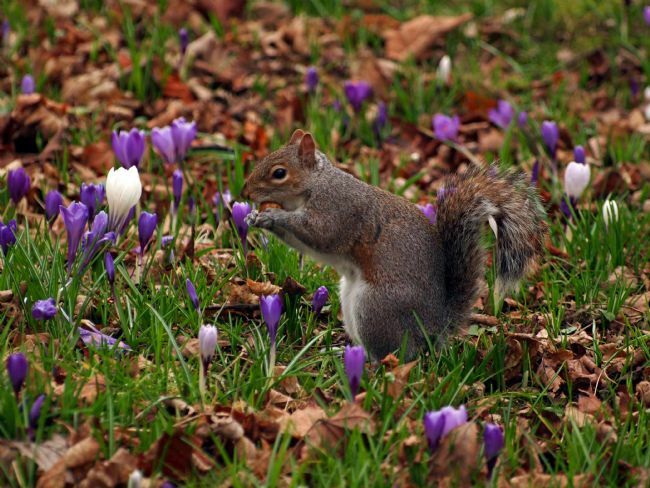 A squirrel enjoys a feast of nuts among the floral surroundings of the spring crocuses at Botanic Gardens in Southport,Merseyside. 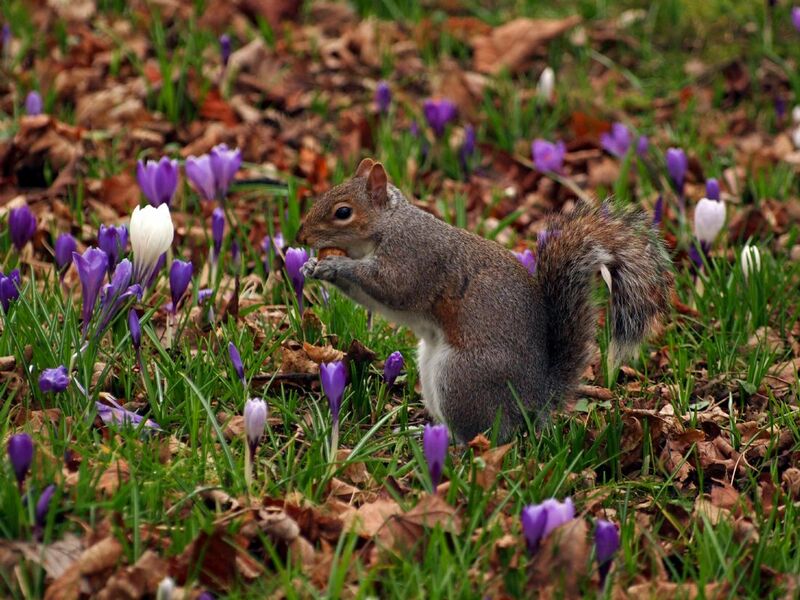 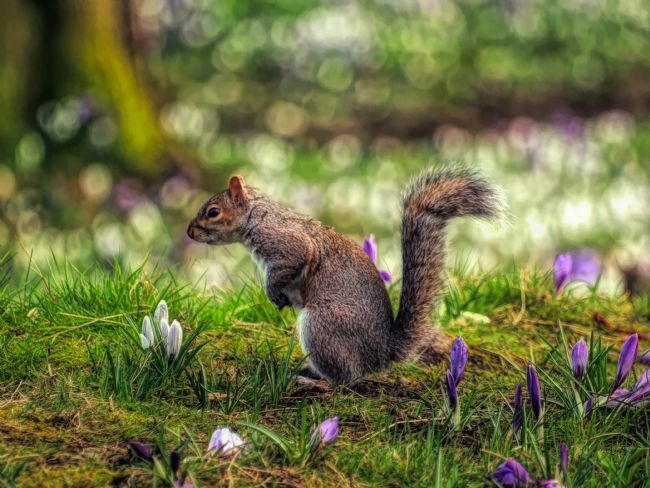 A squirrel looks intensely but doesn't move among the crocuses as if he is waiting for something at Botanic Gardens in Southport, Merseyside. An old barge used for transporting goods or heavy machinery makes it's way down the Leeds/Liverpool canal near Burscough,Lancashire.A sign of bygone times when goods were transported to mills during a time when the canals were bustling with industrial activity. 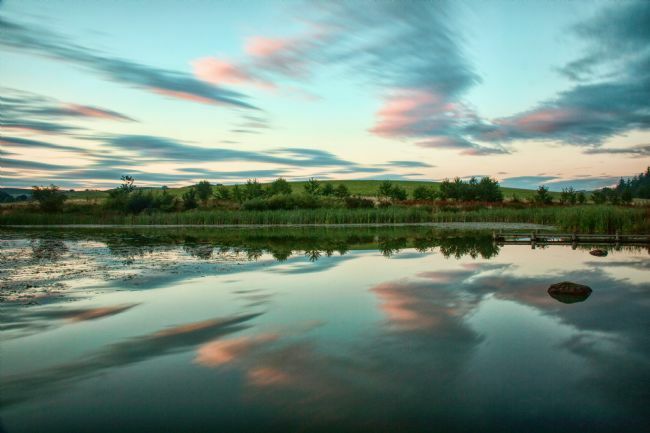 An abstract sunset at Fforest Fields Caravan and Camping Park in Powys, Wales. 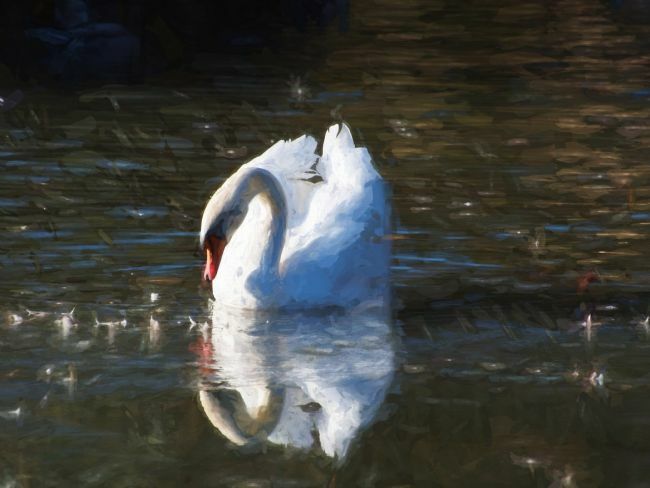 The majestic elegance of a serene swan as it floats on the lake in Hesketh Park,Southport. 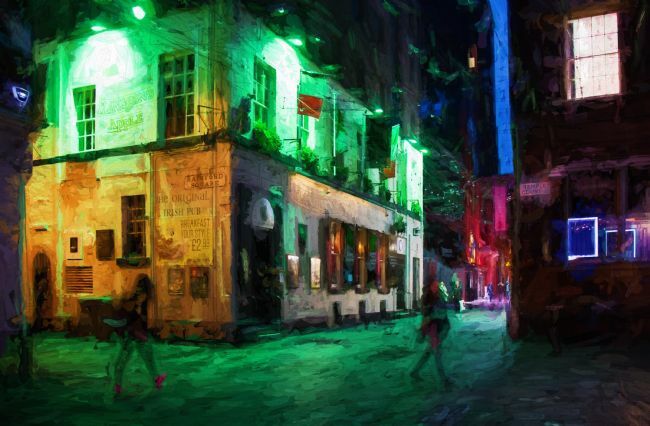 Given a Van Gogh painted look. 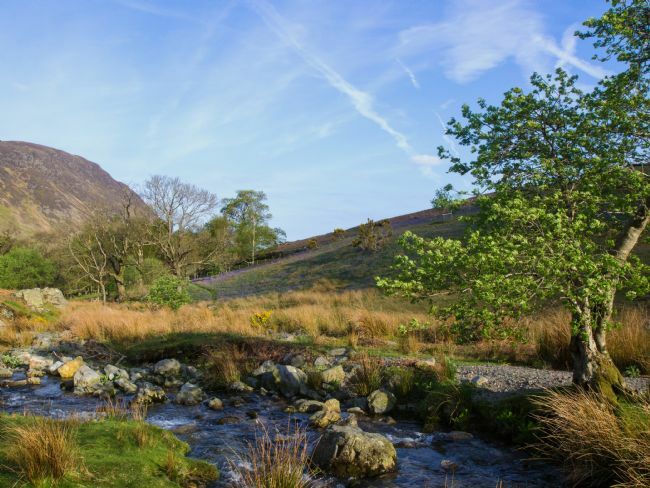 A rocky blue stream rambles through Rannerdale Knottsin the Lake District, it's colour enhanced by the carpet of bluebells on the fell behind. Derwent island house and boat house can be seen from the shore of Derwentwater near Keswick in Cumbria. 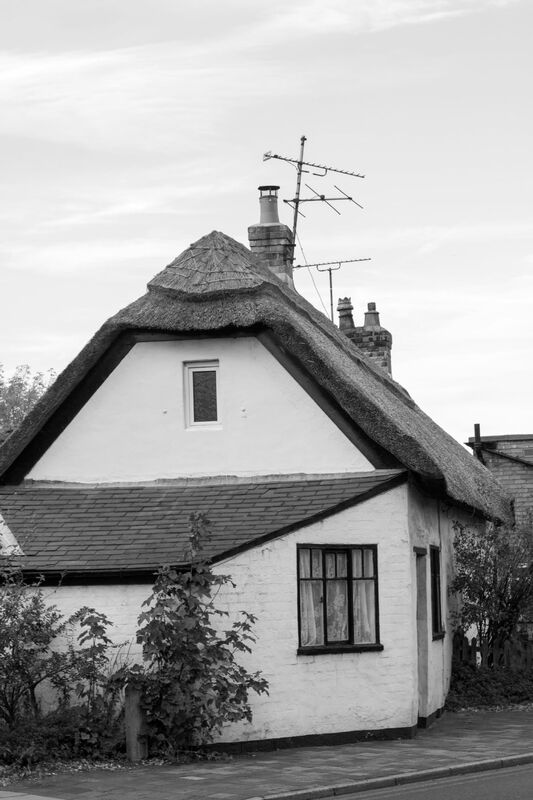 A Grade 2 listed house owned by the National Trust. 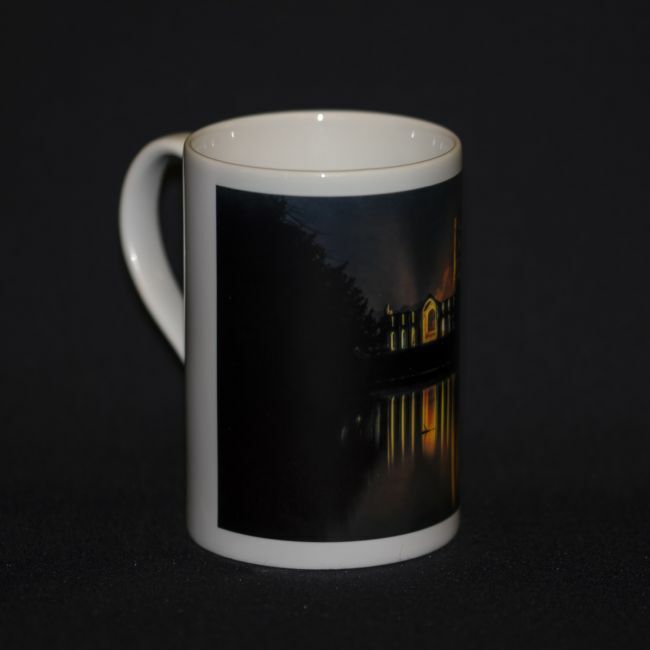 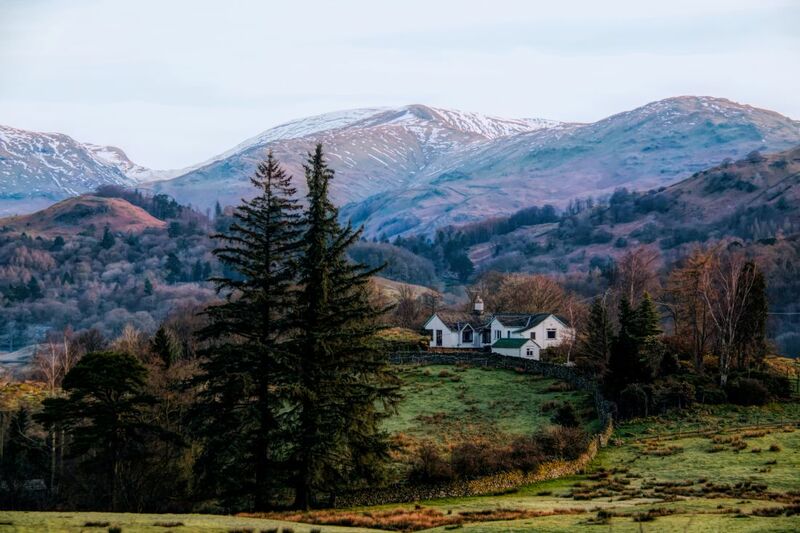 A white cottage tucked away under Loughrigg in the Lake District overlooks Rydal water and the boathouse.An early morning walk round the lake yields reflections of the cottage,boathouse and the surrounding landscape. 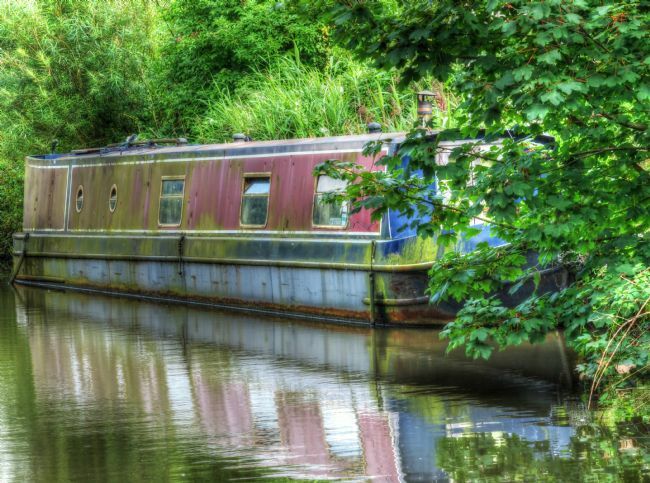 A narrowboat moored on the bank of the Leed/Liverpool canal in Scarisbrick is turning to rust after being neglected. 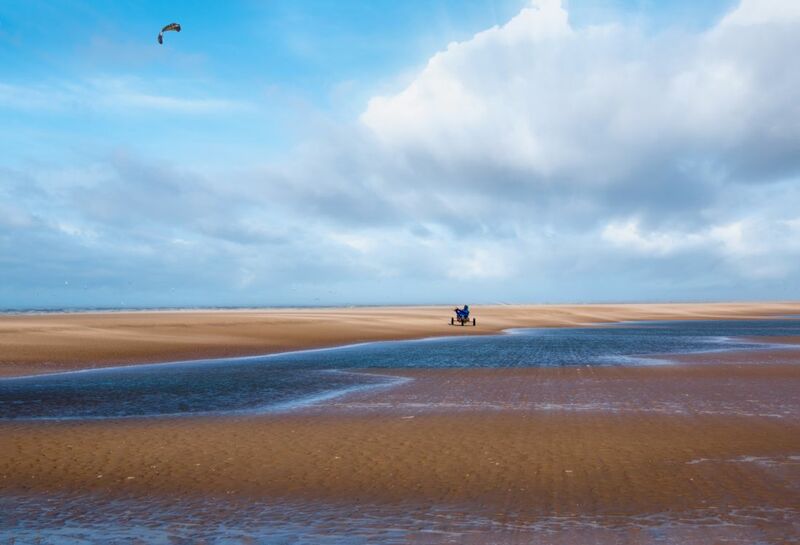 A view over the sand dunes at Formby Point in England reveals stripes on the beach created by sand and channels of water. 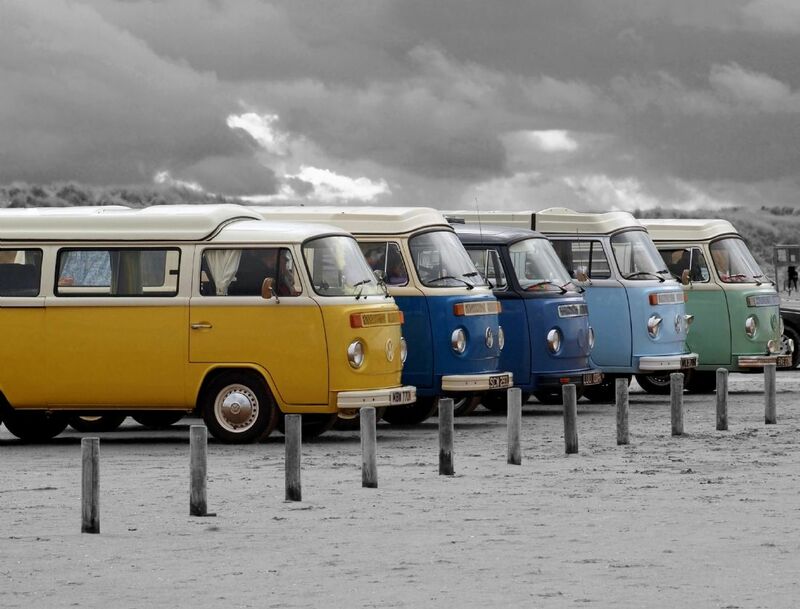 Five different coloured camper vans line up on Ainsdale beach near Southport, Merseyside en route to a rally. A country road at Elterwater in the Lake District leading to Great Langdale which is seen in the background. 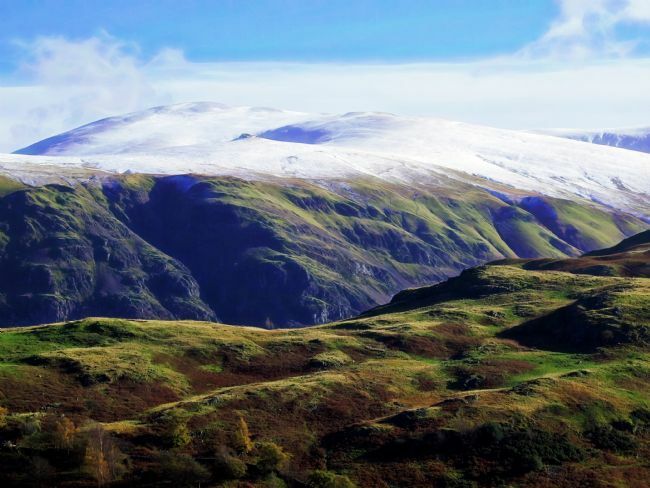 Snow capped mountains dominating the scene with the car showing the scale of the size of the mountains. 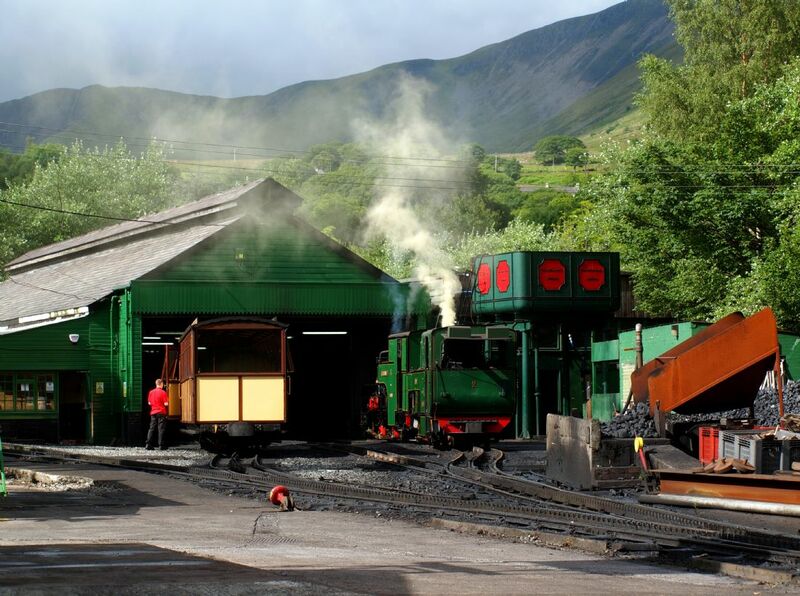 Snowdonia mountain railway depot in Llanberis,Wales where the trains for the summit of Snowdonia are stored and stocked up. A heron at Botanic Gardens, Southport waiting and watching from a high vantage point up a tree. 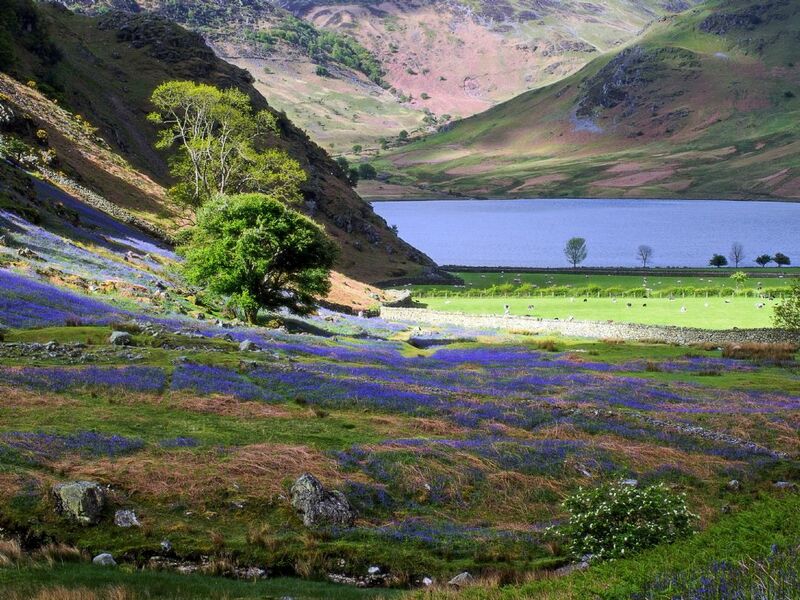 Light and shadows cast across the bluebells covering the fells at Rannerdale Knotts near Buttermere in the Lake District. 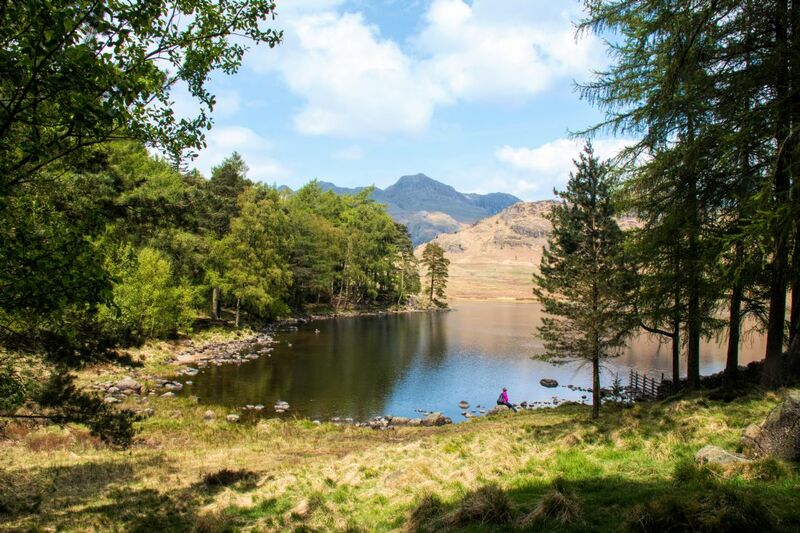 Crummock Water is seen in the distance. An autumn walk through the woods of the Fairy Glen in Parbold,Lancashire on a foggy morning with a hint of colour filtering through. 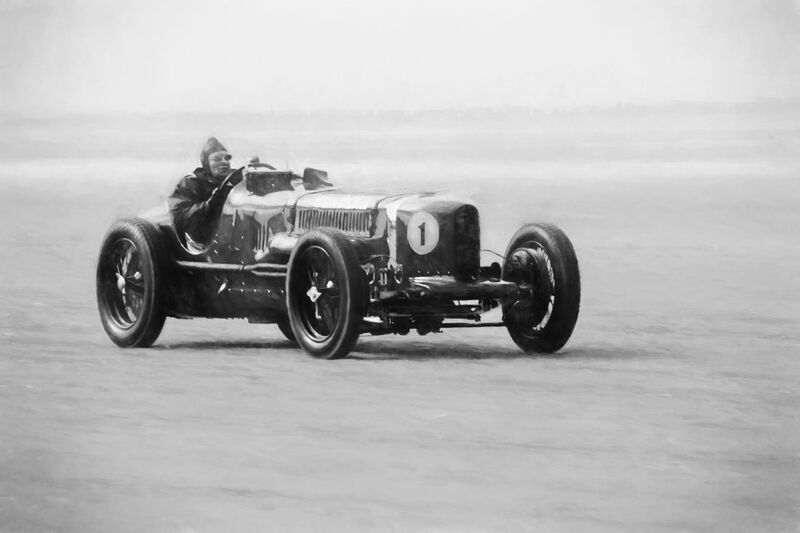 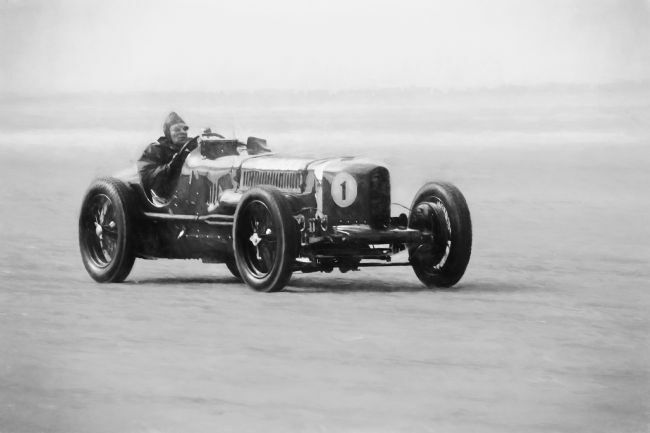 A charcoal painted effect of Sir Henry Segrave's Sunbeam Tiger that reenacted the land speed record after 90 years on Ainsdale beach near Southport, Merseyside. A modern day image of St George's Hall and William Brown Street in Liverpool at dusk given an old photograph look. A man wearing a beret style hat and a satchel over his shoulder walks through Queens Avenue in Liverpool which ha a cosmopolitan feel to it with the outdoor seating for the cafe. 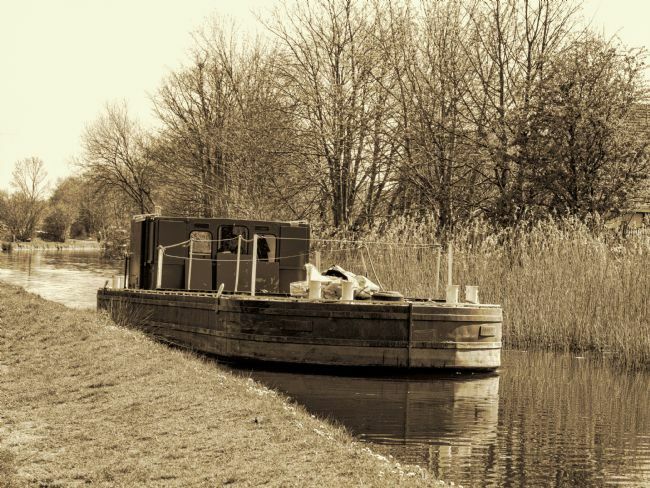 A narrowboat passing through a lock in Scarisbrick on the Leeds/Liverpool canal heading towards the canal side pub. 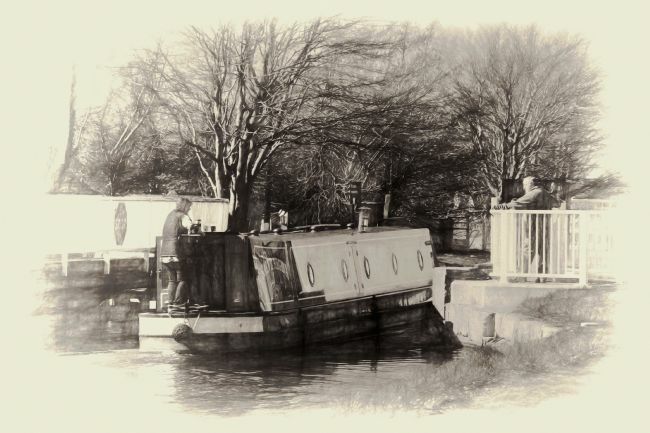 The image has been given a sketch effect as though the viewer was sitting on the bank with paper and pencil. 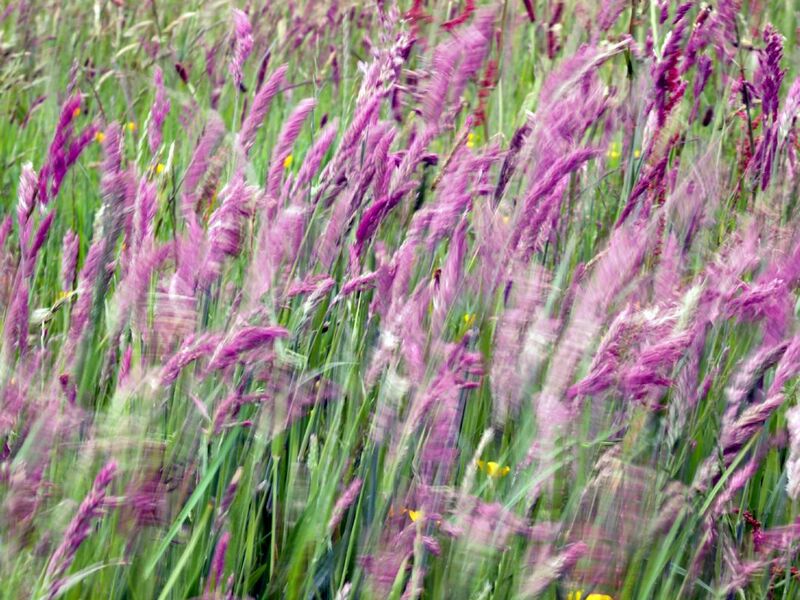 The purple heads of grasses sway in the breeze on Beacon Counry park in Lancashire creating an abstract. iMss Cumbria is a tourist cruiser on Windermere moored at Waterhead,Ambleside in the Lake District. 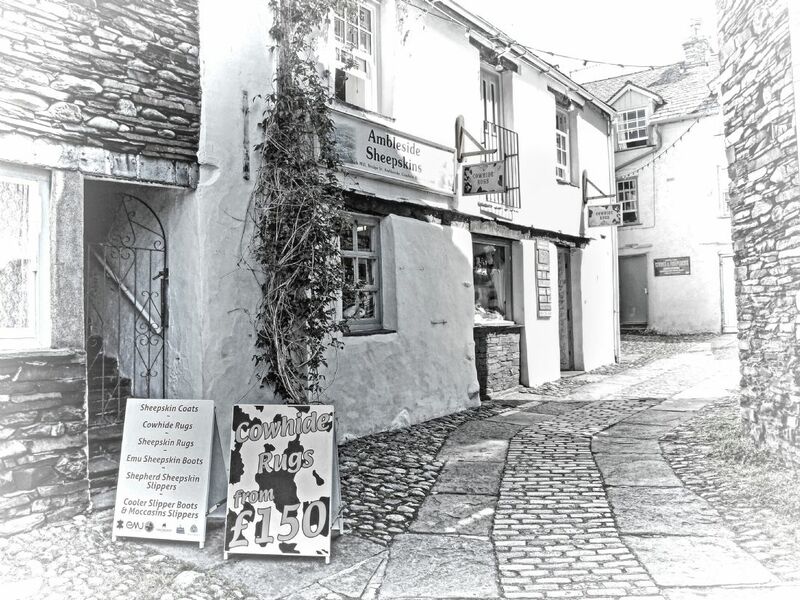 Image has been given a pencil sketch effect. 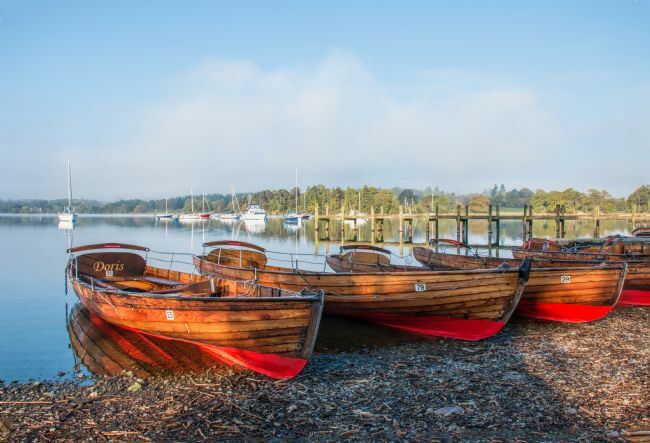 Rowing boats at Waterhead,Ambleside in the Lake District lined up on the shore of Windermere ready for the tourists and day trippers. Flanagan's Apple on Mathew Street in Liverpool at night given an impressionistic effect. 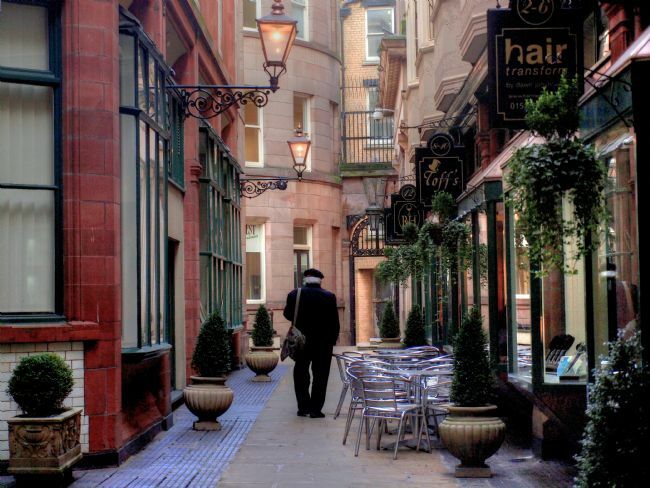 A popular Irish bar and restaurant in the city centre. 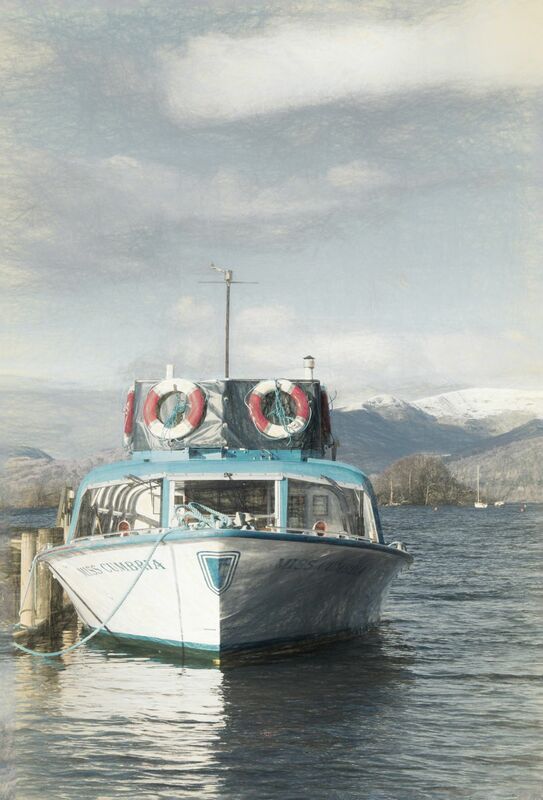 Spartan the yacht moored at Waterhead, Ambleside in the Lake District. It sits alone near a foggy shore. 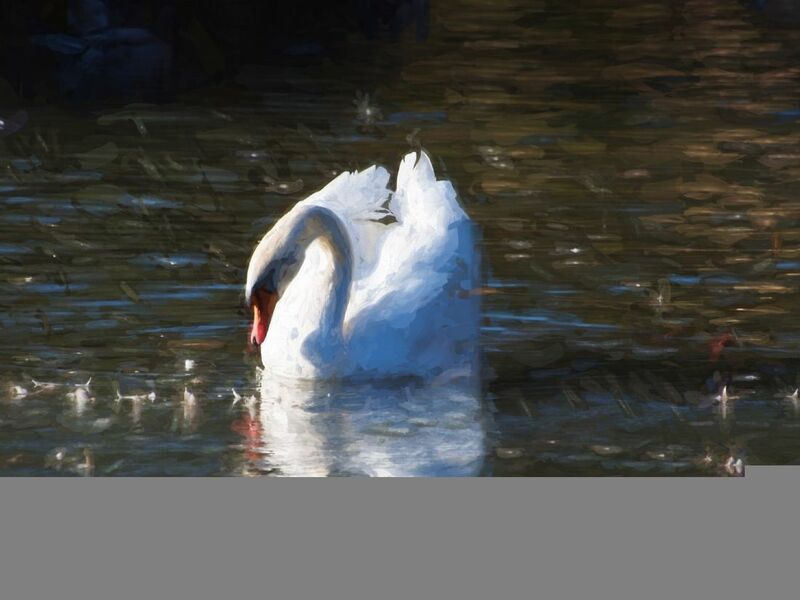 Image has been given a painted effect. A sand surfer takes the opportunity of a windy day to surf on an empty Ainsdale beach near Southport, England. The Queen Mary river dance takes place on the River Mersey in front of Liverpool's Liver building as part of the Cunard 175 year celebration. 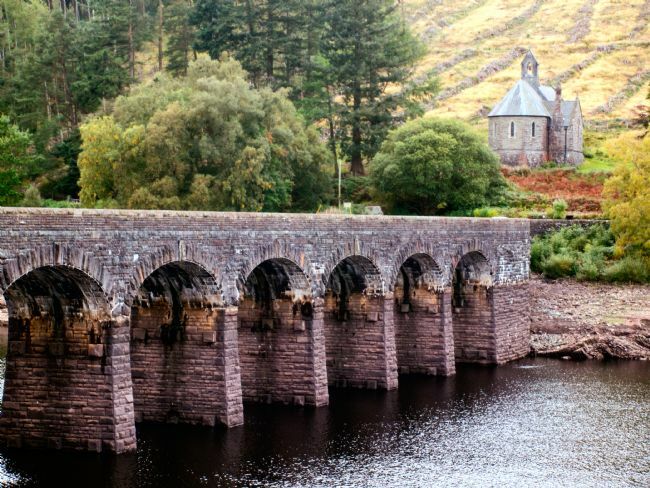 The Elan Valley viaduct leads across a reservoir that provides Birmingham with water to a quaint church called Nantgwyllt church in Wales. An HDR photo of New Brighton lighthouse at low tide with the reflection shown in the rock pools. 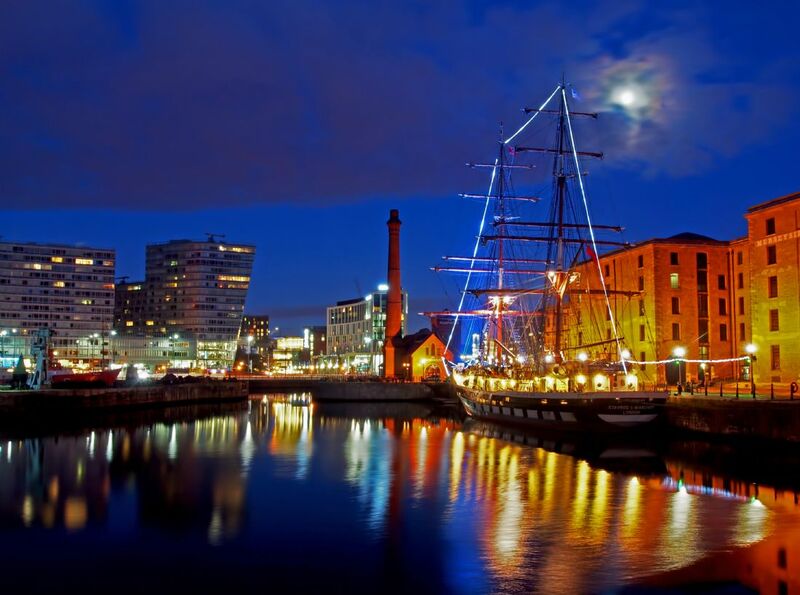 Liverpool at night with reflections in Albert Dock from the lights in the surrounding offices and restaurants.